Detail of the “EDWARD EVANS 1707” mark stamped into the bottom of a drawer in the writing compartment of the scrutoire illustrated in fig. 2. Detail showing the chalk inscription “William / Beake 1711” on the inside right case side of the chest illustrated in fig. 4. Punched “I” mark on the back of the stay rail of the chair illustrated in fig. 6. Printed label of William Savery (advertising rush-seat chairs) on the rear of the stay rail of the chair illustrated in fig. 8. Printed two-part label of John Elliott with “Walnut” written over obliterated “Chestnut” Street address, ca. 1762. (Courtesy, Winterthur Museum.) This label is on a looking glass. 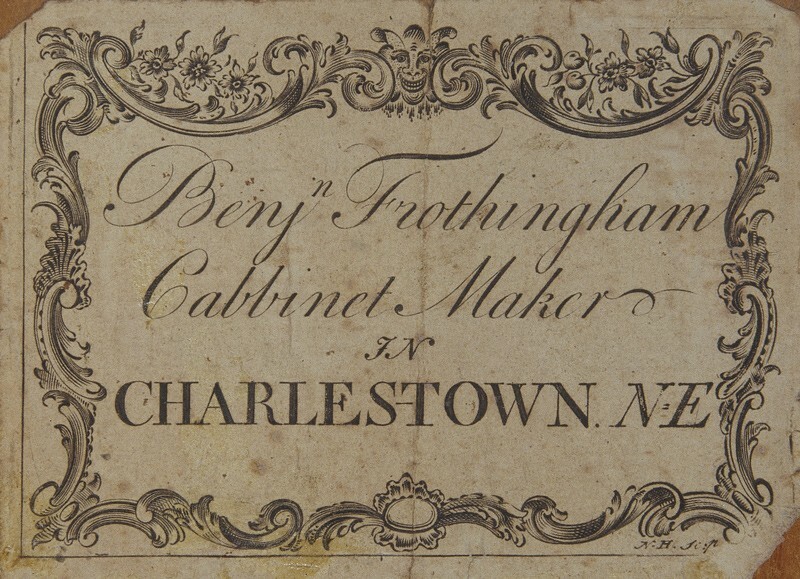 Printed label of Benjamin Frothingham. (Courtesy, Currier Museum of Art, Manchester, New Hampshire, gift of Mrs. Norwin S. Bean, 1967.2.) The label bears the initials of engraver Nathaniel Hurd. It is on the small interior drawer of a desk. 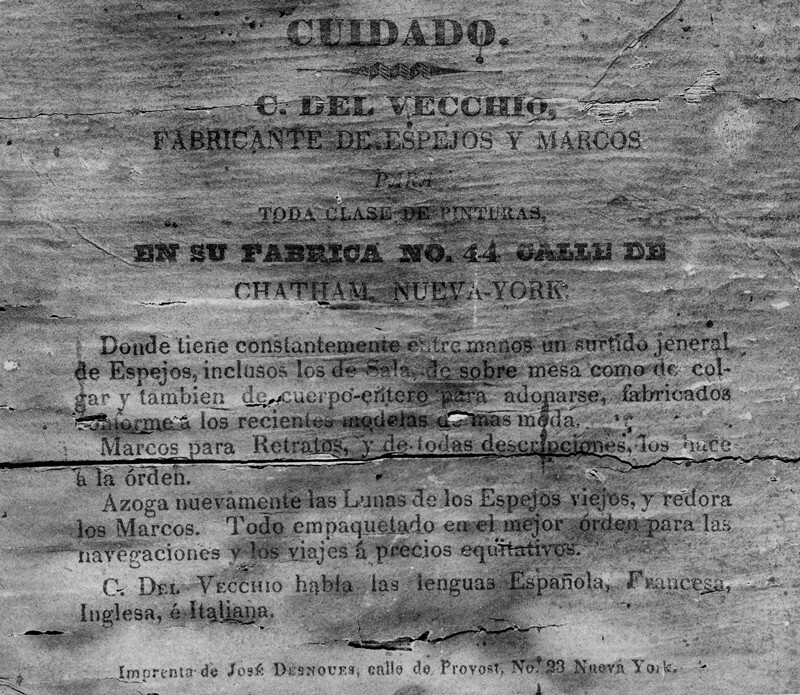 Printed label of Charles Del Vecchio, New York, 1830. (Courtesy, Bernard & S. Dean Levy.) This label is on a looking glass. Label of Joseph B. Barry & Son. (Mrs. Charlton M. Theus, Savannah Furniture, 1735–1825 [Savannah, Ga.: privately printed, 1967], p. 85.) This label is later than the example illustrated in fig. 18. Inscription “C.B. April 16th / 1779” written in chalk on the inside bottom board of the lower case of the chest-on-chest illustrated in fig. 21. Chalk inscription “John W. Thomas / Cabinet Maker / December 27th 1805” on the inside bottom of the second-largest drawer of the chest-on-frame illustrated in fig. 23. 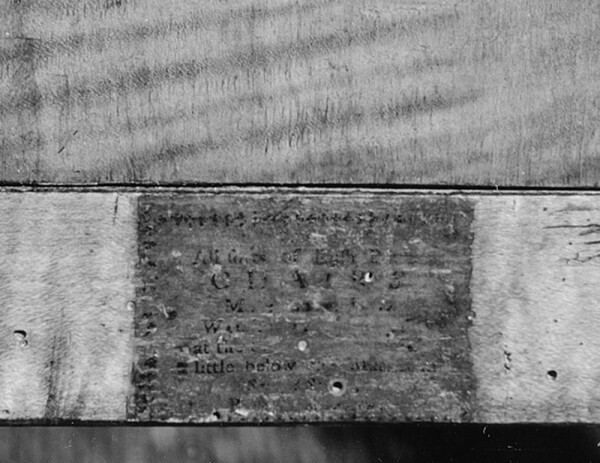 Chalk inscription “George Gregg” at the upper right corner of the backboards of the case of the chest-0n-frame illustrated in fig. 23. Inscription “Made by Moses Bayley Newbury / February AD 1748/9” in the upper case of the high chest illustrated in fig. 26. Bayley signed the upper case twice. Inscription “Made by / Josha Morss / Jany 1748/9” on the back of a lower case drawer of the high chest illustrated in fig. 26. Morss signed the lower case twice. Painted inscription “For / Elizabeth / Noyes / E N” crossing the back of both cases of the high chest illustrated in fig. 26. 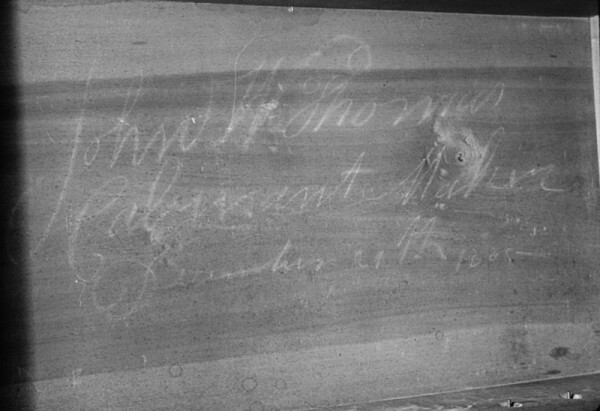 Chalk inscription “Upper Edge” on the lower case backboards of the desk-and-bookcase illustrated in fig. 31. This same inscription is on a northeastern Massachusetts secretary-and-bookcase also marked “Gilmanton” (New Hampshire) and dated June 5, 1799. Ink inscription “Thomas Whightman / Carver back of [illegible] Horton’s [? ]” on the card table illustrated in fig. 34. Stencil mark of William Fisk of Boston inside the well under the folding top of the card table illustrated in fig. 34. 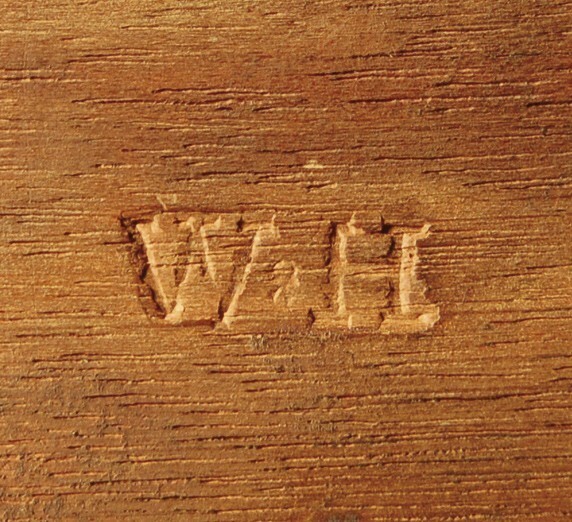 Stamped mark “WH” on the bottom of the rear rail of the chair illustrated in fig. 38. Paper label of Joseph Birdsey Jr. (1769–1805) of Huntington, Connecticut, pasted to the seat bottom of the armchair illustrated in fig. 41. 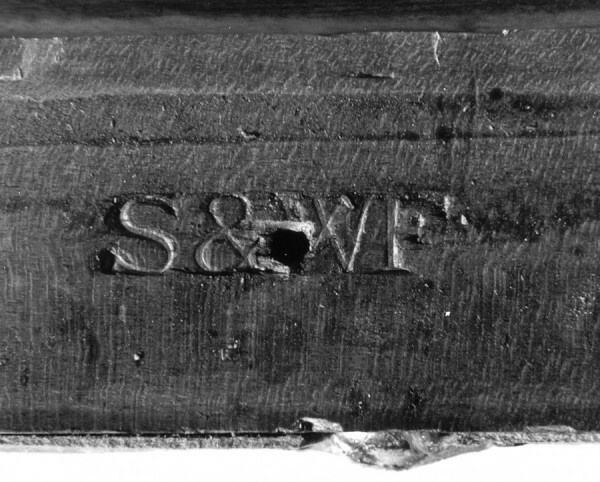 Stamp “S & WF” on the rear rail of the chair illustrated in fig. 44. 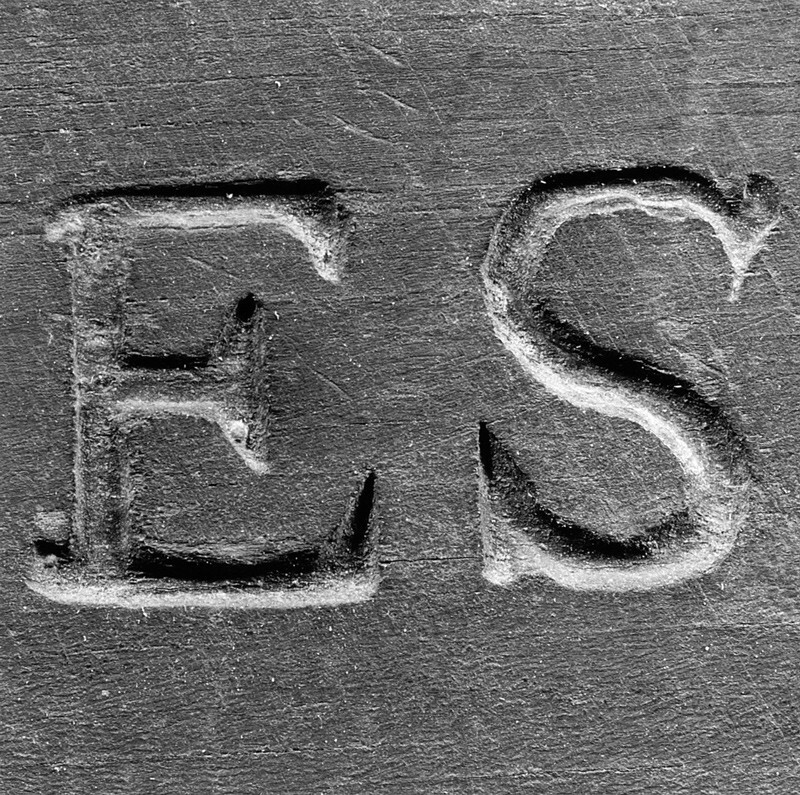 Stamp “ES” on the desk illustrated in fig. 46. 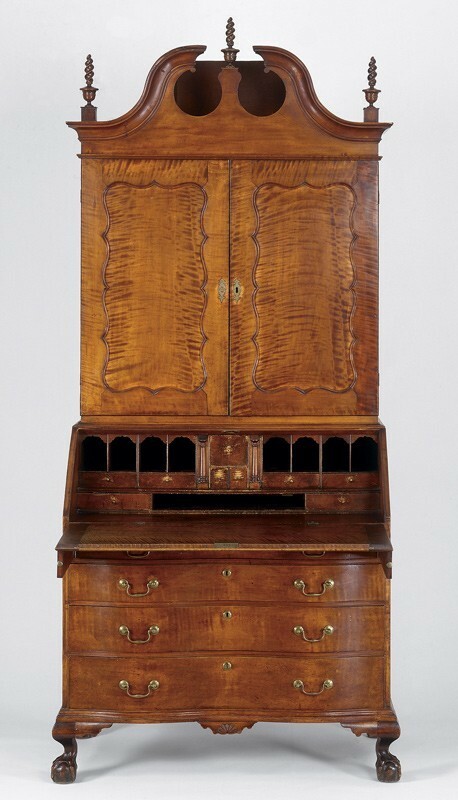 Desk-and-bookcase, Salem, Massachusetts, 1795–1805. Mahogany with white pine. H. 101 1/2", W. 46", D. 26 1/2". (Private collection; photo, Ali Elai, Camerarts.) This object is marked “JS,” probably for Jacob Sanderson (1757–1810). Stencil mark of Michael Allison. (Courtesy, New York State Museum.) This mark is on a mahogany chest of drawers. 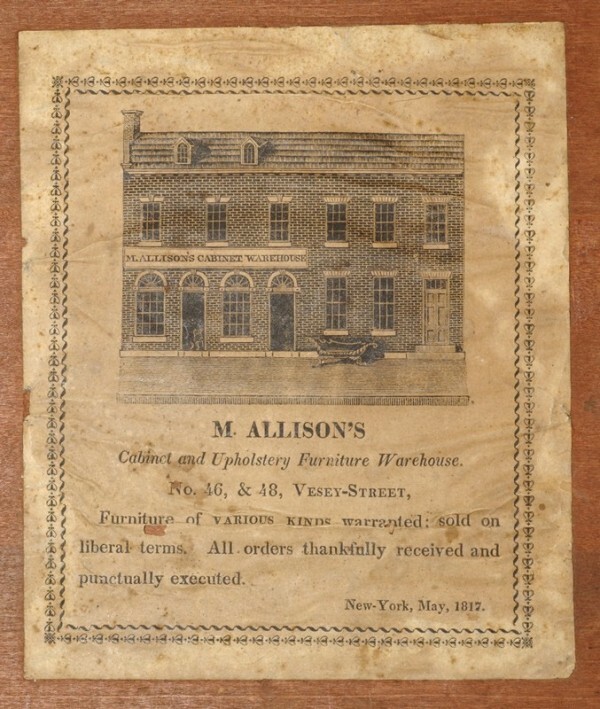 Printed paper label of Michael Allison dated May 1817. (Courtesy, New York State Museum.) This label is on a mahogany sideboard. The makers of most surviving examples of early American furniture are unknown, but to the great joy of today’s collectors and students, a few early artisans inscribed, branded, labeled, or stenciled their work. These distinguishing marks wrest pieces of furniture from historical anonymity and transform them into representatives and artifactual evidence of specific places and/or times of manufacture and the products of particular people. Marked objects can also serve as Rosetta stones for the identification and evaluation of anonymous examples. No regulations governed where, when, or why any of the various kinds of marks were used on any given furniture form, although the type of mark and its purpose influenced placement. Furniture historian Margaretta Lovell argues that labels—notably those of Newport cabinetmaker John Townsend—promoted the essentials of an artisan’s business. Morrison Heckscher recently countered that Townsend’s labels primarily served to establish his legacy in a very self-conscious manner. In fact, no single explanation describes the many functions labels and other marks served. They range from the personal and private to public roles. Important to furniture appreciation and history, makers’ marks also affect current market values, which in turn inspires the production of fakes. That practice and the methods to detect false marks lie beyond the scope of this study. Occasionally, early furniture owners—as opposed to makers—marked their objects, but that practice also is not addressed here. Instead, this study focuses on the types of marks that makers used, speculates on the reasons for their use, and suggests some interpretative implications. Seventeenth-century American furniture makers may have marked their products, but no authentic inscriptions have come to light. Some scholars might argue that Shrewsbury, New Jersey, joiner Robert Rhea was the first to mark his work, since a joined armchair has his initials and the date 1695 carved into the back (fig. 1). However, the initials represented him and his wife. They were part of the chair’s ornament and conformed to broader practices of identifying owners of furniture, silver, and other valuable household furnishings with prominently displayed initials rather than trade practices of identifying the artisan. The earliest-known American maker’s mark, “EDWARD EVANS 1707,” is on the Philadelphia scrutoire illustrated in figures 2 and 3. This mark looks as if it was created by striking one character at a time, rather than by striking a single multicharacter marking iron. Assuming that 1707 is the year when Evans began using this mark, that date is only four years later than the earliest English furniture maker’s mark. Unfortunately, little is known about Evans, and other men with the same name lived in Philadelphia during the late seventeenth and early eighteenth centuries. Despite the fact that a marking iron or set of dies can be used multiple times, no other furniture with Evans’s stamped name is known. Philadelphia joiner William Beake signed and dated a four-drawer chest in 1711 (figs. 4, 5). Although details of his life are sketchy, Beake’s inscription may have been related to his release from an apprenticeship. Furniture historian Cathryn McElroy cites a 1709 bequest of money to “Wm Beakes Junr who is now an Apprentice wth Wm Till of Phil. 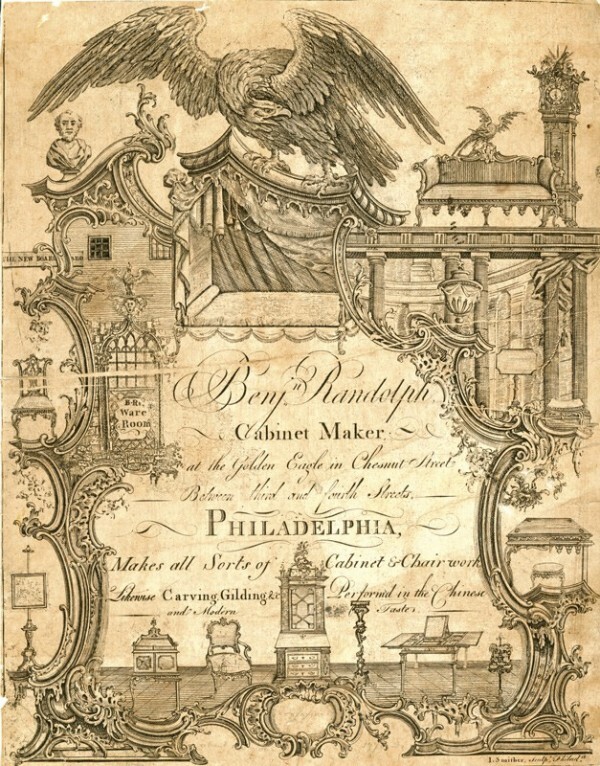 Aforesd Joyner.” Inasmuch as no other William Beake or Beakes appears in contemporary Philadelphia records, this joiner-in-training was likely the maker of the chest. His master Till died in 1711, assuring that Beake was no longer in his employ. The 1711 chest, therefore, may mark and celebrate his entry into the trade as a free artisan. 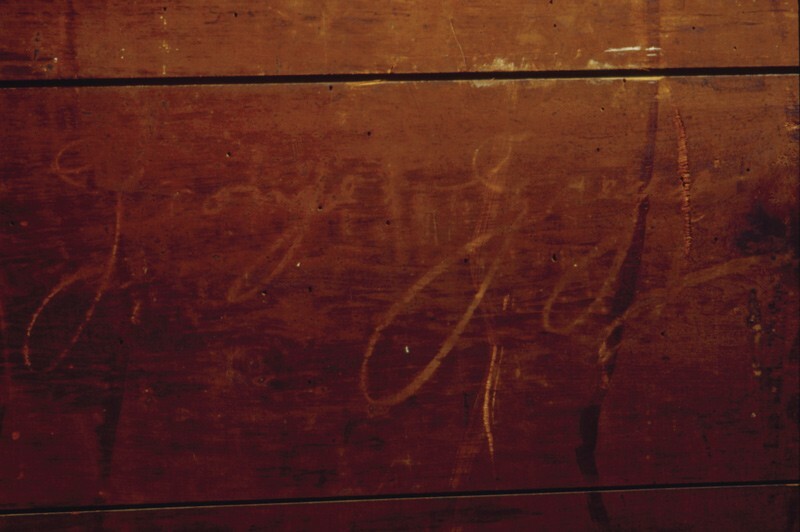 Another youthful signature is that of Joel Baily (1732–1797) of West Chester, Pennsylvania, who signed a desk-and-bookcase in 1747 at age fifteen. Regrettably, no further evidence enlightens the seemingly audacious act of a youngster setting his mark for the world to see. Too often, marks lack contemporary explanation or context, although other apprentice signatures are known and discussed below. One of the more enigmatic American marks was used in the Boston area in the first decades of the eighteenth century. Made of punch marks arranged as an “I” with a dash through the center (also interpreted by some furniture scholars as back-to-back Es), this monogram occurs on several baroque turned chairs (figs. 6, 7). Several furniture historians and dealers assigned the mark to Edmund Edes, a joiner reported to have been in Boston by 1709. Furniture historian Benno Forman studied the evidence more thoroughly and found great variety among the nearly thirty marked chairs that he recorded. These differences effectively eliminate the possibility of the mark being that of an owner. Similarly, structural and ornamental variations indicate that several different chair makers were responsible for this seating. 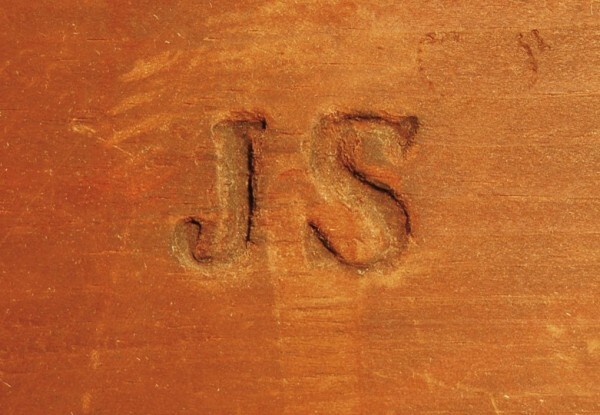 One “I”-monogrammed chair is made of beech, suggesting a British origin. The common denominator among all the “I”-marked chairs is that they are caned. Forman’s theory that the mark likely belonged to a Boston-area caner is compelling, although a suitable candidate has not been identified. Labels printed on paper are the most widely recognized form of furniture makers’ marks. English usage is documented from before 1712, the latest working date for John Guilbaud at the “Crowne and Looking Glasse in Long Acre” in London. How much earlier Guilbaud may have used this label is unknown. Similarly, the first use in America cannot be dated precisely. Philadelphia makers William Savery (1721/22–1787) and John Elliott (1713–1791) are among the earliest candidates. None of the six different paper labels Savery used is dated, nor does any furniture on which they survive establish specific dates. In the absence of any chronology, similarities and differences in wording among the various labels suggest a probable sequence. The earliest label is likely the one that stated Savery made “all sorts of rush bottom chairs,” reflecting his apprenticeship under turned–chair maker Solomon Fussell (figs. 8, 9). 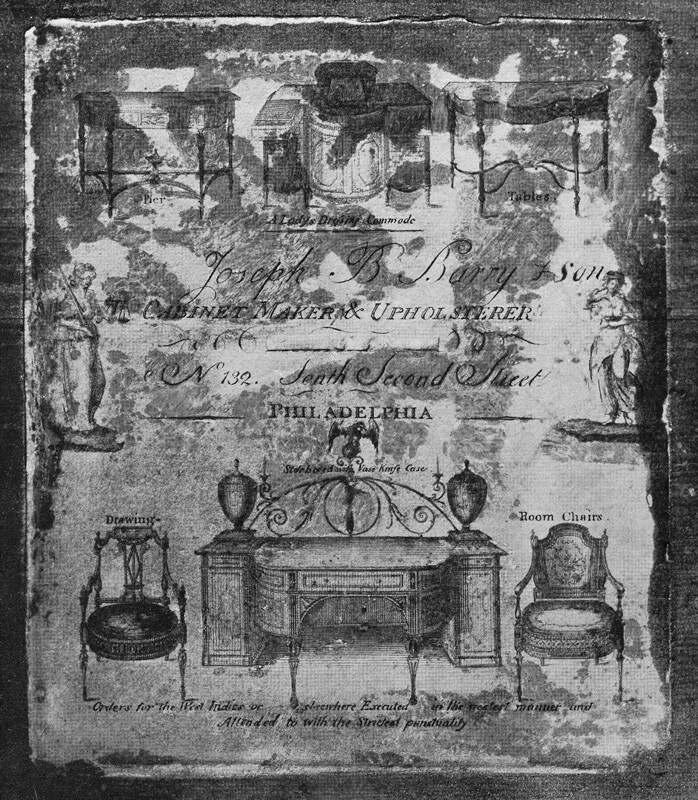 Three of four labels advertised “chairs and joiner’s work made and sold by William Savery” and directed readers to his place of business “at the sign of the Chair.” The remaining label in this group of four referred potential customers to the “Sign of the Chest of Drawers, Coffin, and Chair,” suggesting that he diversified his shop production further. This label is probably later than the three “sign of the Chair” labels. The sixth label records only Savery’s name above “[No. ——],” with space left for inscriptions in ink. It is probably the latest because it occurs on a serpentine-front chest of drawers, a furniture form that is not documented as having been made in Philadelphia (or elsewhere in America) before 1771. Establishing precise dates or date ranges for individual labels used by Savery is more problematic. The earliest reference to him as an independent artisan is in the November 1, 1750, issue of the Pennsylvania Journal, where Savery described himself as a “Chair-maker in Second Street.” In the absence of other biographical evidence, it seems reasonable to speculate that Savery would have described himself as a chair maker and joiner if he had been using a label mentioning both types of work at that time (fig. 9). Moreover, it is unlikely that Savery used labels when his career began, circa 1742. At that date, his personal circumstances were modest, and the use of printed labels was not an established practice among Philadelphia furniture makers. Savery may have begun using labels in the 1750s, concurrent with a few other American furniture makers. 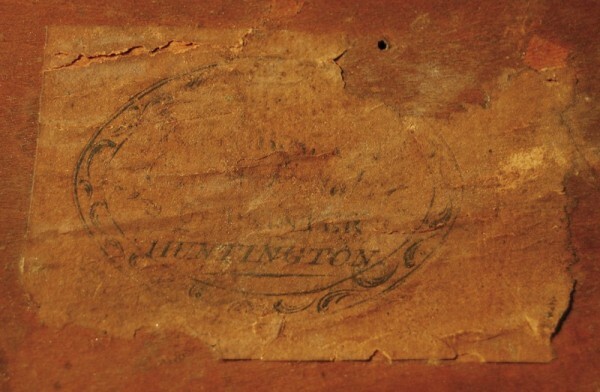 John Elliott used three different labels on the looking glasses that he imported from England and sold from his “Looking-glass Store.” His earliest, “Chestnut Street” label dates before 1762 (fig. 10), when he moved to the Walnut Street address noted on his other two labels. Although his first American label cannot have been produced earlier than 1753, when he arrived in Philadelphia from Leicester, England, several years may have passed before he had it printed. While working in England, Elliott labeled a dressing table with a paper label identifying himself as a cabinetmaker, chair maker, joiner, and turner who also repaired looking glasses. Written records show that he first worked as a cabinetmaker on Chestnut Street, where he made and repaired furniture for Philadelphians Edward Shippen and Charles Norris. Not until 1757 did Elliott alter his advertisement to note that instead of working as a cabinetmaker, he now sold imported goods. Presumably, this date approximates the introduction of his first American label, printed in both English and German, which announced that he “imports and sells all sorts of English looking-glasses” and repairs them. 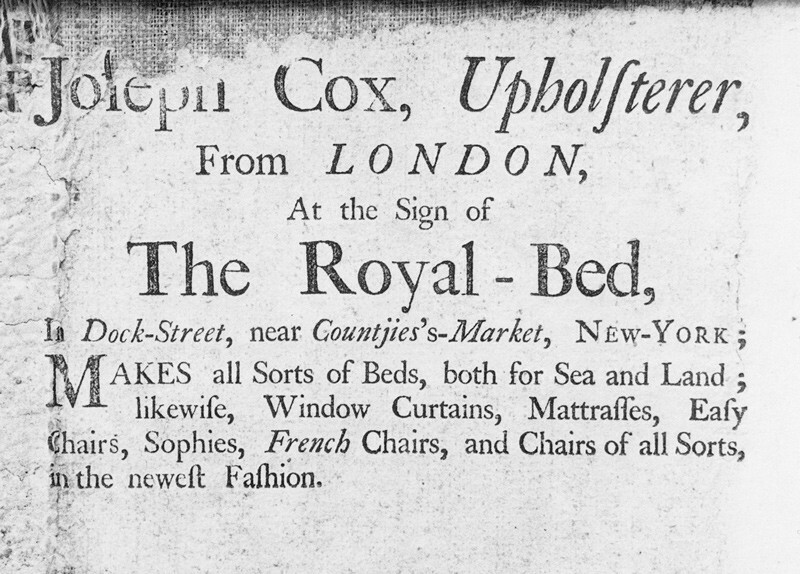 Elsewhere in the American colonies, upholsterer Joseph Cox of New York City labeled a sofa between 1757 and 1760, a date range determined by his tenure at the address listed below his name (fig. 11). Based on a strict reading of the evidence, this printed label could be the earliest one used by an American furniture maker. Benjamin Frothingham of Charlestown, Massachusetts, began using printed paper labels many years after 1753, when he signed a bombé desk at the youthful age of twenty-one. Because Frothingham’s labels bear the initials of Boston silversmith and engraver Nathaniel Hurd, they must predate the latter’s death in 1777 (fig. 12). Even so, these labels continued to be used well into the 1790s and perhaps until Frothingham’s death in 1809. 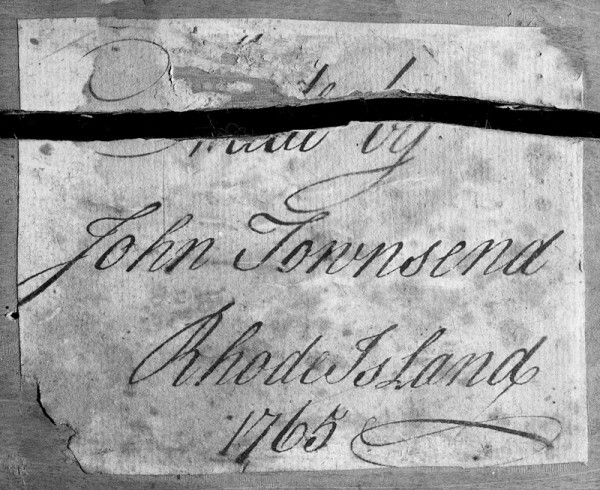 Newport furniture makers Job, Edmund, and John Townsend used paper labels with their names handwritten in ink. John inscribed and dated furniture by 1756, but his earliest handwritten label is dated nineteen years later (fig. 13). In 1786 he penned the date on the first of many printed labels. All of the manuscript and printed labels used by the Townsends also include their place of business. When placed in locations that would be visible while the piece of furniture was being used, labels with addresses served as advertisements for their makers. Toward that end, some makers also described the products they sold or the services they provided. In addition to listing his wares, John Elliott’s Philadelphia labels incorporated German text, clearly intended to attract business from people who might otherwise not think of him as a convenient or suitable supplier. 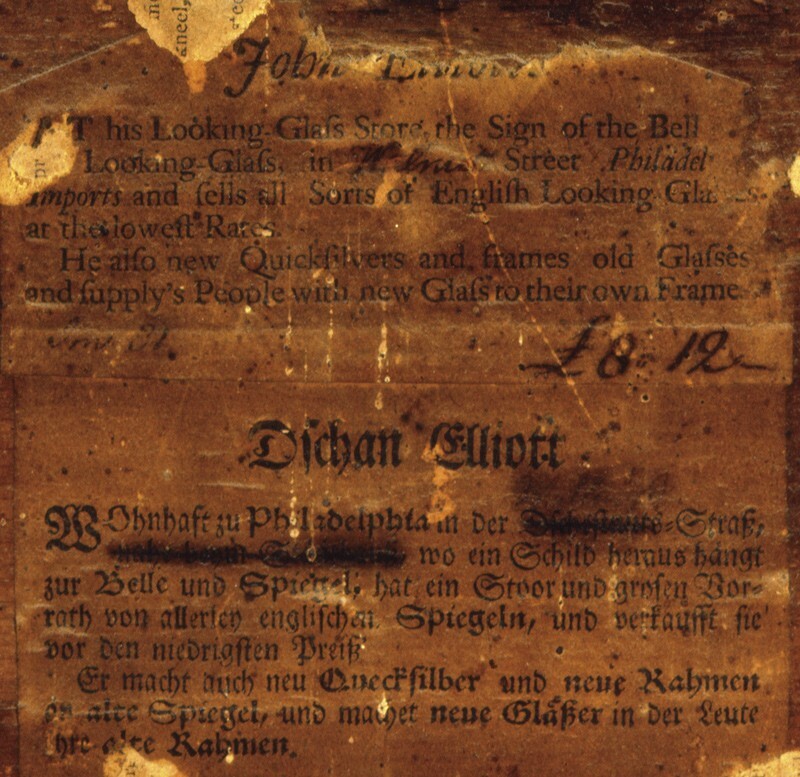 Elliott’s first English-German label, marked “Chestnut Street,” was printed on two pieces of paper pasted together to appear as one (see fig. 10). 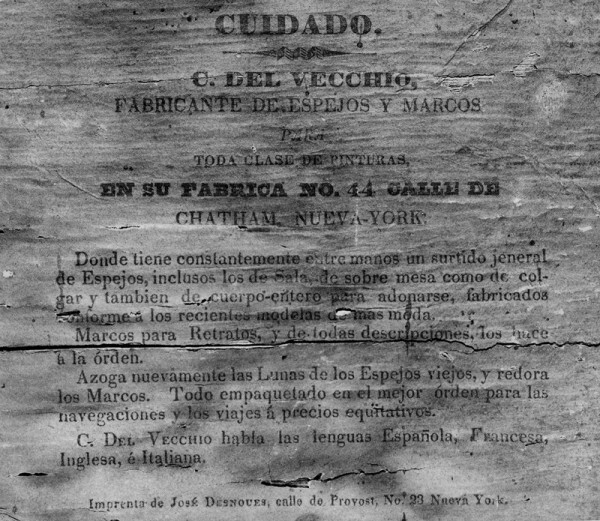 New York looking-glass maker Charles Del Vecchio, who arrived from Italy in 1800, used a label in the 1830s that was printed entirely in Spanish (fig. 14). In it Del Vecchio noted his fluency in Spanish, French, English, and Italian. This label may have been produced for furniture intended primarily for export from New York to the Caribbean and South America. Labels, like newspaper advertisements, directed patrons to a maker’s place of business. Moves to new addresses, such as Elliott’s relocation from Chestnut to Walnut Street, occasioned new labels. 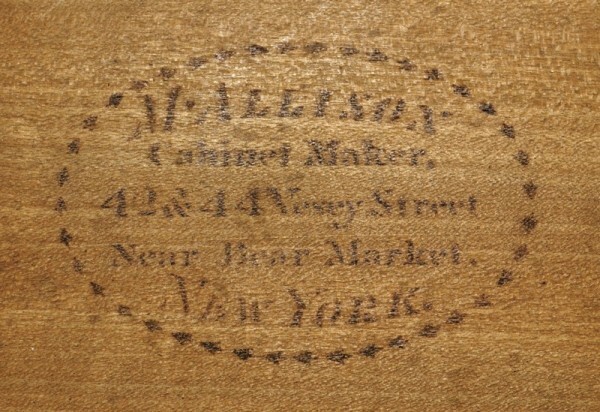 Over the course of his long career, New York furniture maker Michael Allison (1773–1855) used more than a dozen different labels and painted stencils, which cited three different business addresses between 42 and 48 Vesey Street. Six of his labels were printed with dates between January 1817 and November 1825, so for Allison, having new labels made was a regular affair. In contrast, George Shipley, also of New York, cautiously left the street number blank on one of his two known labels, which featured a neoclassical secretary-and-bookcase within an oval border of bell flowers (fig. 15). He inked in “161” when he used it sometime between 1791 and 1795, the dates he occupied those quarters on Water Street. Shipley’s other label, simpler than the first but ornate by most standards, was engraved with the full address (fig. 16). Historical evidence does not confirm whether it was printed before or after the inked example. Similarly, Jacob Forster (1764–1838) of Charlestown, Massachusetts, had labels printed with “179” with space for adding the year in ink. He used these labels at least through 1814. By the 1790s several labels incorporated attractive illustrations of furniture into their compositions, suggesting the makers’ familiarity with fashionable designs as well as their implied competence to make them. New York City artisans in particular used this strategy, perhaps building on a tradition established by Samuel Prince, whose 1770s label featured a chest-on-chest and an armchair. 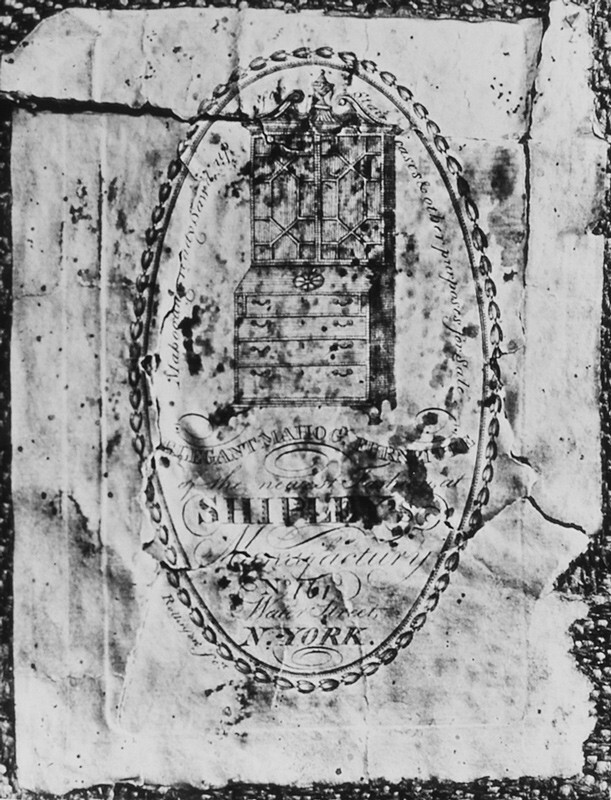 Surviving labels of Andrew Anderson (1794–1805), Elbert Anderson (5 Maiden Lane label, 1786–1796), Thomas Burling (36 Beekman Street label, 1787–1793), Joseph Vail (ca. 1790–ca. 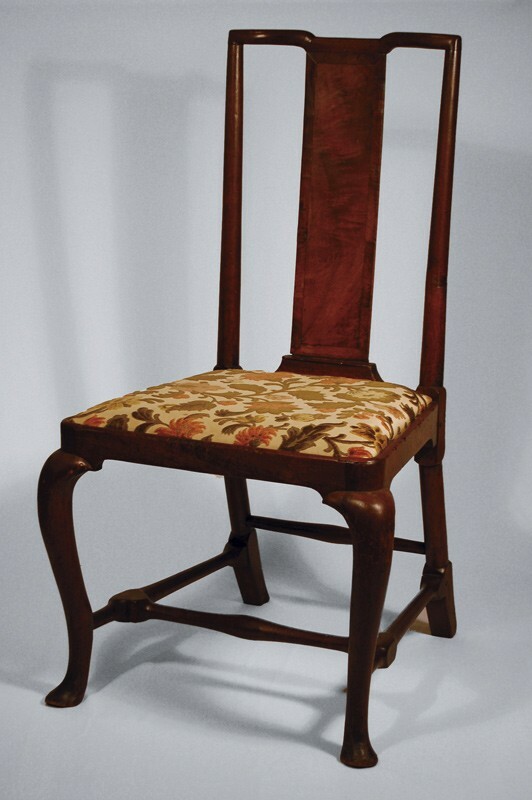 1806), and William Whitehead (75 Pearl St. label, 1794–1799) include two or more different furniture forms in each, as did the partnership of Samuel Kneeland and Lemuel Adams of Hartford, Connecticut. 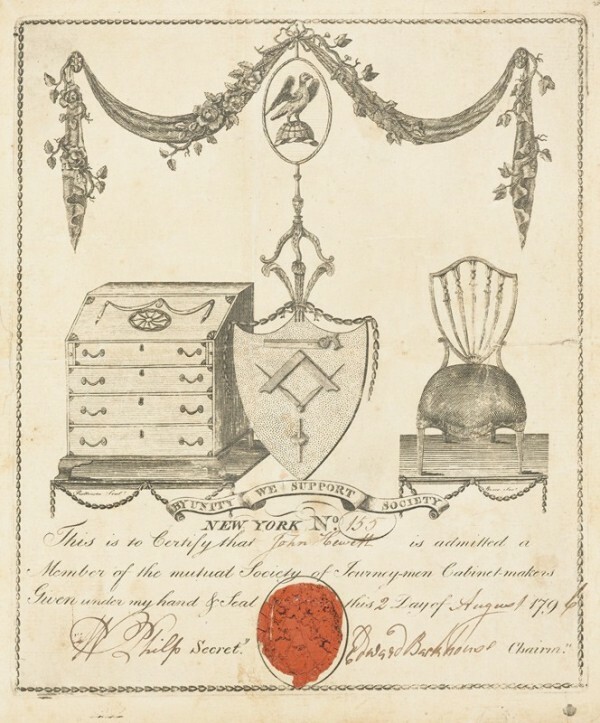 In addition to George Shipley’s label, William Rollinson (1762–1842) engraved a membership certificate for the Society of Journey-men Cabinet-makers in New York that was issued in the mid-1790s. 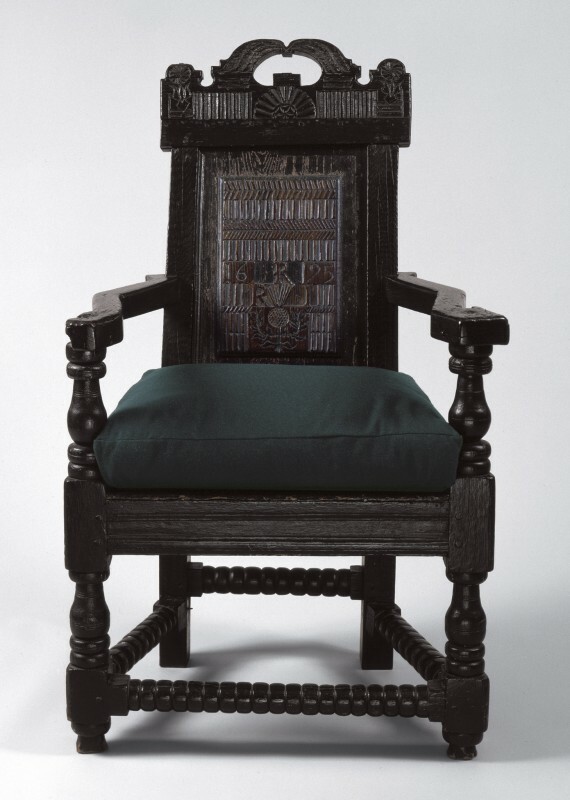 It featured an inlaid fall-front desk and a shield-back side chair with five carved ribs (fig. 17). Abraham Godwin (1763–1835), another New York engraver, executed other labels for local furniture makers, notably Burling’s. In Philadelphia, James Akin engraved very ambitious and nearly identical labels for William Camp (1773–1822) of Baltimore and Joseph B. Barry (1757–1838) (figs. 18, 19). In addition to the maker’s name and address, each label depicts six pieces of furniture borrowed directly or slightly modified from Thomas Sheraton’s Cabinet-Maker and Upholsterer’s Drawing-Book and Appendix (London, 1793), and Barry’s also features two draped figures. The labels are not dated, but Barry added “& Son” in ink to his printed example. His son joined him circa 1810. Akin returned to Philadelphia in 1808 after a four-year absence, which suggests a narrow date range for his work. In a second version of the Barry label, the line naming him and his son is completely engraved and centered properly (fig. 20). The Camp label, which is not attached to a piece of furniture, probably dates from the period 1808–1810 as well. Label placement on furniture was typically—but not always—in unobtrusive but readily accessible places, such as drawer bottoms, inside rear rails of chairs, or tops of tilt-top table pillars. Certain chalk or ink inscriptions written in visible places may have been intended to serve as advertising, but most were not. When “CB” scrawled his initials in red chalk across the bottom board of a chest-on-chest on April 16, 1779, he marked the work as his own but not in a way that communicated that fact to the world at large (figs. 21, 22). Modern identification of the maker as probably Caleb Byrnes of Stanton, Delaware, rests on accurate identification of regional characteristics and the absence of any other maker in the region with suitable initials. The fact that CB may have been well known in the community he served reduces the utility of his signature as advertising. Outside that community, he was anonymous, a circumstance aggravated by the lack of an accompanying place-name. The private role of most signatures lies outside the mechanics of the marketplace. Motivation for signing a piece of furniture arose from different causes. Rather than advertisements, these signatures were personal proofs of accomplishment or statements of authorship, typically for an audience that never materialized in a way that benefited the maker. Sometimes a personal message or caricature accompanied the signature, as on the underside of a Philadelphia center table: “Made by Elias Reed in the year 1831 this table cause me to give a Black Eye to a frenchman.” Recognition of the private function of these signatures makes comprehensible the practice of signing furniture in hidden places. Beake’s 1711 inscription (fig. 5) cannot be read or even recognized without removing the drawers of the chest. Many makers’ signatures have recently been discovered only when the signed piece of furniture was partially disassembled. 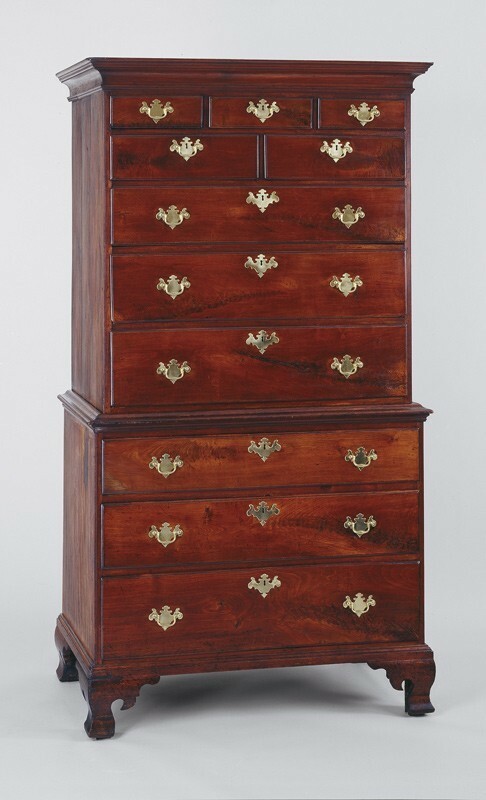 In the early 1980s the Winterthur Museum took a chest of drawers off display because questions had arisen about the age of the object and the originality of its top. Removal of the top revealed a chalk signature on the subtop, which elevated the chest into the best-documented example of a sizable group of Connecticut furniture. Many other obscure signatures have been found. Signatures that commemorate transitions from apprenticeship to independent artisan are among the most common makers’ marks. 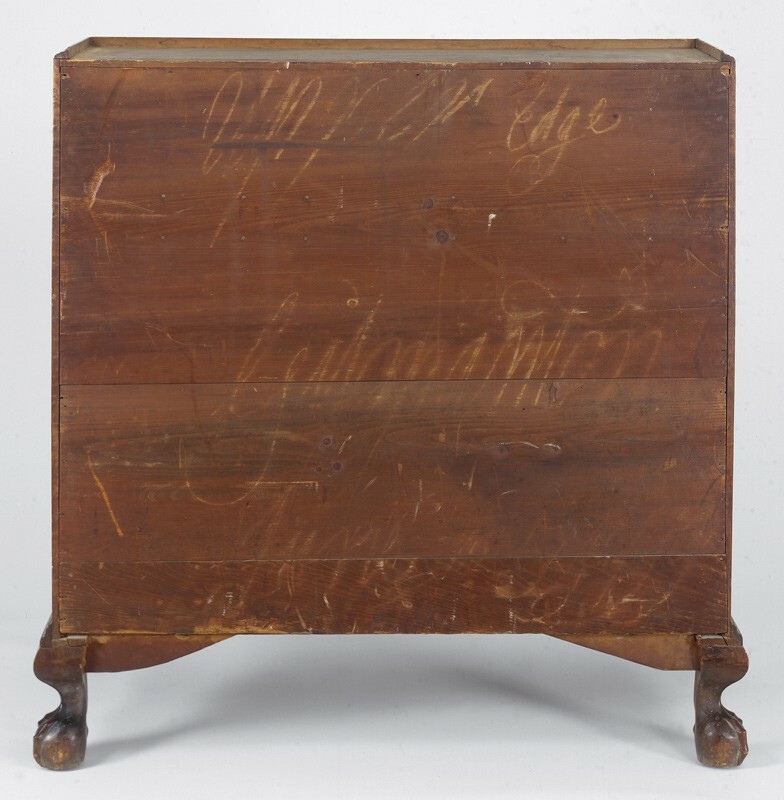 A chest-on-frame probably made near Kennett Square, Pennsylvania, bears the bold chalk signature “John W. Thomas / Cabinet Maker” and the date “December 27th 1805” across the inside bottom of the second-largest drawer (figs. 23, 24). 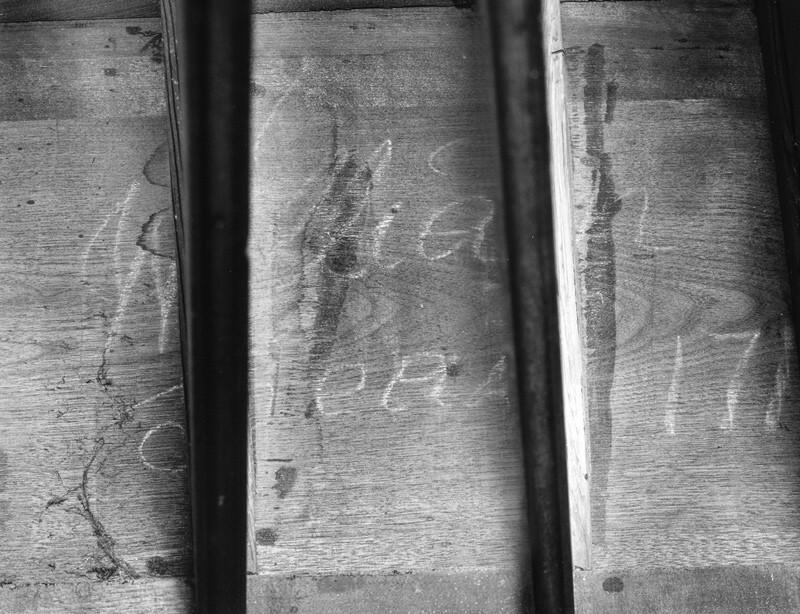 A second chalk inscription at the upper right corner of the backboards and in a different hand reads “George Gregg” (fig. 25). Few details of Thomas’s life are known, although he is listed in Philadelphia directories from 1809 through 1814 as working at two addresses on South Fifth Street. From 1796 through 1819, George Gregg (1763–1833) was listed regularly as either a joiner or a cabinetmaker in tax assessments of Kennett Square, a small rural community southwest of Philadelphia. A receipt for making a coffin indicates that he was working on his own in Kennett Square by 1791. Gregg’s inventory taken on March 18, 1833, includes the usual variety of joiner’s tools and a turning lathe and chisels. Combining inscriptions and evidence again suggests the likelihood that the chest-on-frame represented Thomas’s coming-of-age as a cabinetmaker, after serving an apprenticeship with Gregg. His talents then propelled him into Philadelphia, where he became sufficiently established by 1809 to appear in city directories. Several years later, Thomas signed another piece of furniture. This chalk inscription, on the outside back of the large bottom drawer of a federal worktable, carries the date October 16, 1813. Although the significance of the date is simply lost, the presence of the date provides precise documentation for when the table was made. 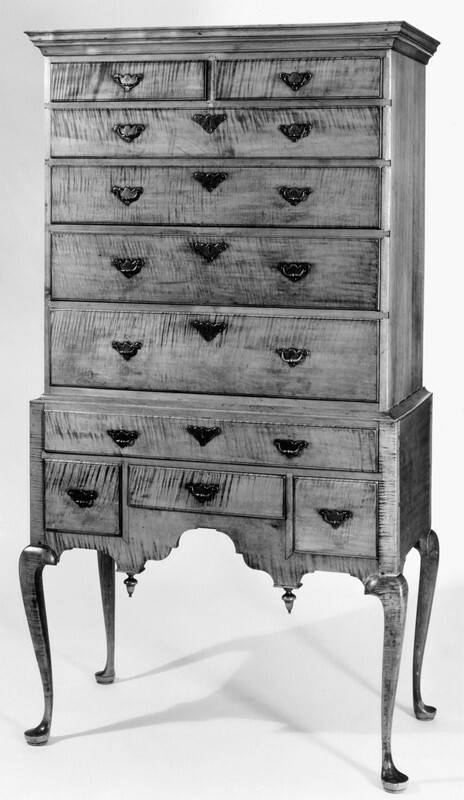 William Houston (1755–1830) signed a high chest of drawers made in a style associated with John (1746–1792) and Samuel Dunlap (1752–1830) of Goffstown (also inscribed on the high chest) and Bedford, New Hampshire, although very few pieces of this distinctive furniture form are specifically documented to either Dunlap. Had not the Dunlaps’ name already been established before Houston’s was discovered on this high chest, furniture historians would likely have elevated Houston’s name as the progenitor of a shop or school. 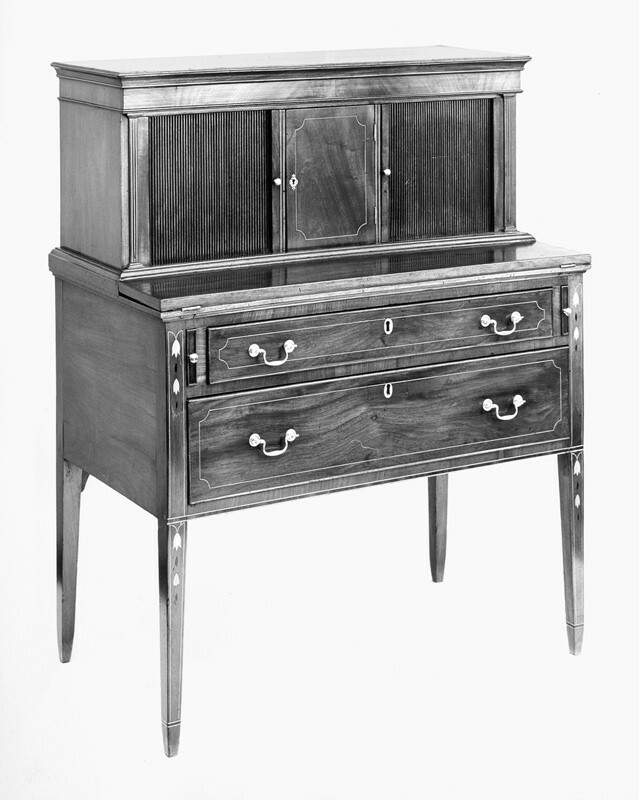 In fact, Houston was an apprentice or part-time employee of John Dunlap when he probably made the high chest. A parallel exists in the Joel Joselyn (b. 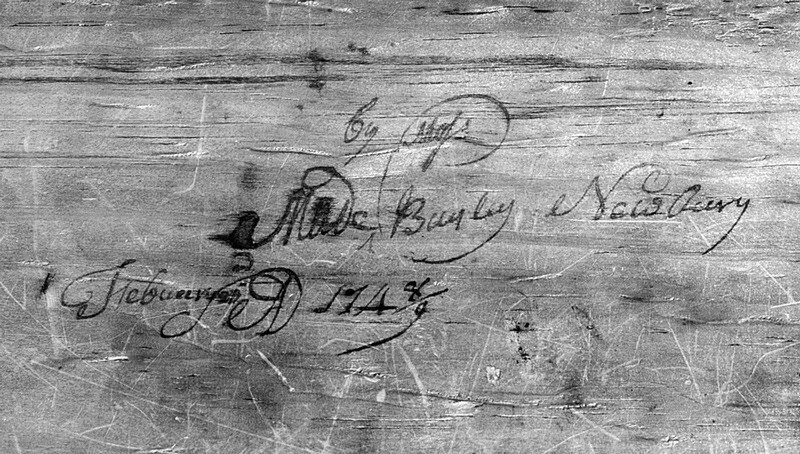 1776) signature on another high chest of drawers. Joselyn was apprenticed to Samuel Dunlap, who charged work by Joselyn to third parties from 1793 to 1797. Soon after Joselyn completed his apprenticeship and married, he moved from Henniker, where Samuel Dunlap was then working, to Lebanon, some thirty-five miles away, where Joselyn continued to make furniture. Provenance of the high chest, reinforced by another inscription that appears to be the first owner’s name, places it in Henniker. Multiple signatures on a single piece of furniture typically signify a cooperative venture. Moses Bayley (1716–1778) and Joshua Morss (1714–1756) of Newbury (now Newburyport), Massachusetts, memorialized their partnership in 1749 when each signed the high chest illustrated in figures 26–29. The duration of that venture is not known, although the two artisans married sisters. Multiple labels pasted to the same object occasionally mask more complex business relationships. Looking-glass retailer Joseph White of Wilmington, Delaware, applied his label directly on top of John Elliott Jr.’s label. On the backboard of another looking glass, White inscribed “Sold at Joseph White’s / Apocathery Shop / Wilmington” below an Elliott label. After White’s death in 1798, his executors paid Elliott almost six hundred dollars to settle debts, which presumably included many purchases of looking glasses. In a similar vein, Salem maker Mark Pitman’s name, written in ink on a small piece of paper, is pasted over the printed name of Josiah Caldwell, for whom the label must have originally been made (fig. 30). Caldwell is known to have worked on Essex Street, also Pitman’s address, but except for a few pieces of furniture with similarly altered labels, his work is not identified. Historical details have not come to light, but evidence suggests that Pitman bought out Caldwell’s labels, and perhaps his business. The location of inscriptions on furniture helps distinguish owners from makers and destinations from places of origin. Since the late 1940s, a striped maple desk-and-bookcase was thought to have been signed “Walter Edge” (figs. 31, 32). Closer examination of the inscription decades later indicated that the inscription was a shipping mark reading “Upper Edge.” Similarly, the “1794 / T. Back” inscription was once considered a maker’s mark, but the letters more likely designate “top back.” Several large case pieces have “bottom” written in chalk on the bottom boards and/or “top” on the top boards. During the eighteenth and nineteenth centuries, large pieces of furniture were often crated for protection, but backs and bottoms were apparently left partially exposed and used as a surface for shipping instructions. Most inscriptions simply stated which end was up. Place-names are more problematic. In some examples, a named locale seems more logically a destination rather than a place of origin. Marking furniture according to destination has a long history, although not many objects have been so identified. In 1705, for example, Boston upholsterer Thomas Fitch billed Mrs. Judith Pease in New York “for Six Rushia leather Chairs, and . . . for six more of the same sort all marked P with chalk on the ba[ck].” Anyone transporting the Newburyport high chest by Bayley and Morss could not overlook “For/ Elizabeth/ Noyes/ E N” written in large letters across the backs of both cases in black paint (fig. 29). 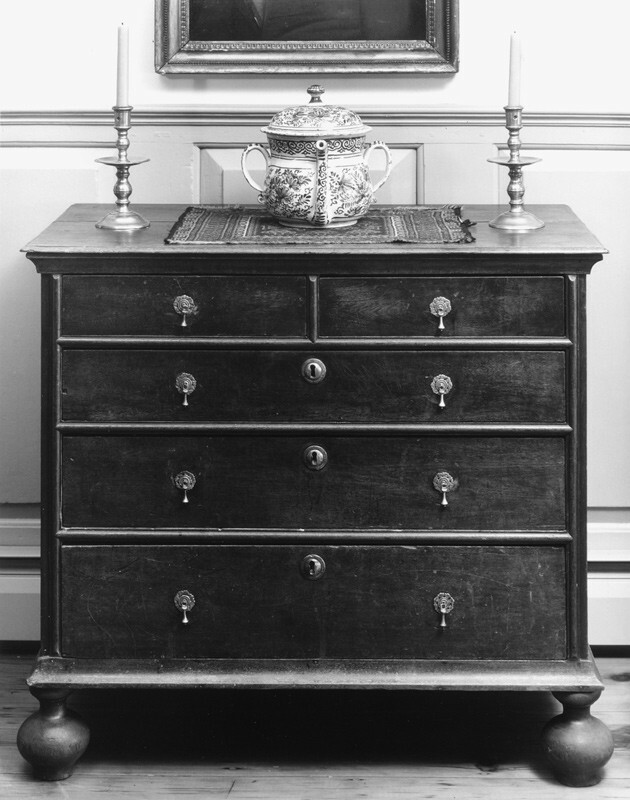 Eighteen-year-old Elizabeth Noyes Smith (1731–1816) received the high chest as a wedding present from her parents. 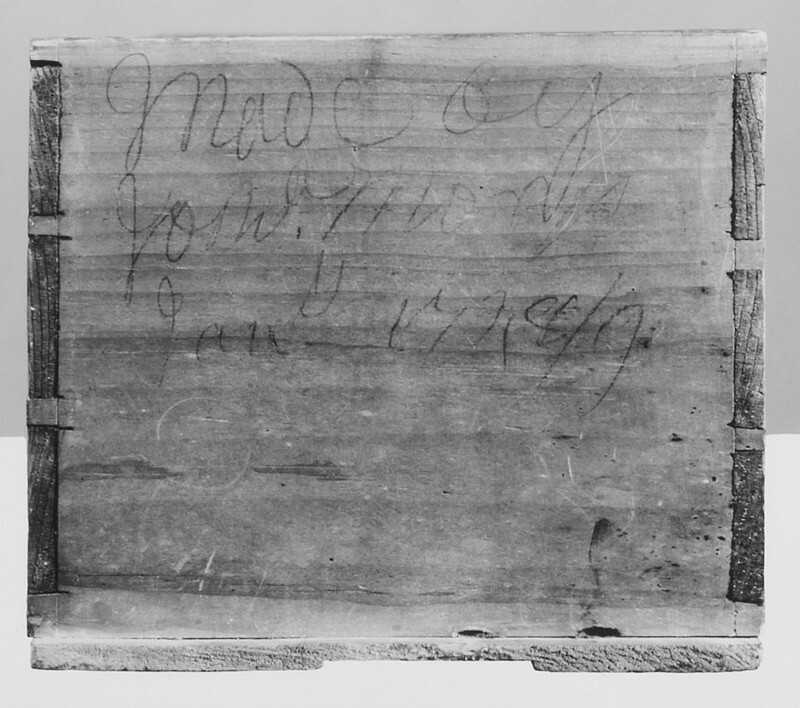 A Massachusetts chest-on-chest has “To Bo[x]ford” inscribed in chalk across the back. Boxford is a small rural town northwest of Salem. A southeastern New Hampshire bowfront chest of drawers has a crude map to its destination drawn on the inside of the backboards. 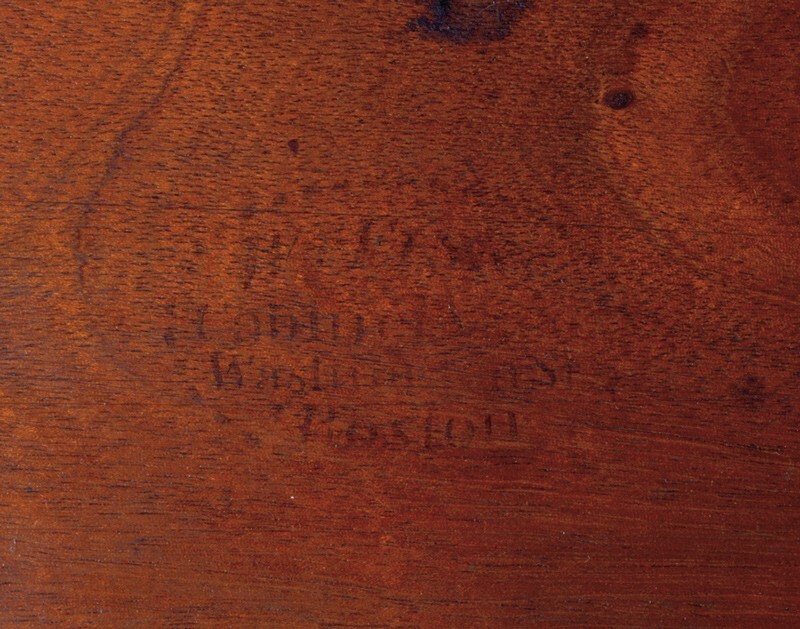 Ambiguity surrounds the Gilmanton name on the 1799 desk-and-bookcase (fig. 32). Independent of the misinterpretation of “upper edge,” furniture scholars have assumed that Gilmanton marks its place of origin. Accordingly, they postulated a small but vital furniture-making community there, although evidence of any specific activity remains to be discovered. Absent the place-name, furniture scholars would readily identify the desk-and-bookcase as a product of Salem or some other prominent northeastern Massachusetts furniture-making center. At present, Gilmanton seems more likely a destination than an origin. There is little ambiguity about the inscription on the top board of the lower section of another desk-and-bookcase: “Nath Gould not his work” (fig. 33). When the desk and bookcase are assembled, the inscription is invisible. This is a furniture maker’s message to other artisans, who would likely have seen the object when it was disassembled and temporarily stored, perhaps in a shop. The reason for the inscription is less apparent. Morrison Heckscher speculates that it was written by a “disaffected workman” who created the object that Gould—the richest cabinetmaker in Salem, Massachusetts—merely sold. A recently discovered inscription by Boston carver Thomas Wightman (1759–1827) illuminates occasional needs for worker-to-worker communication. 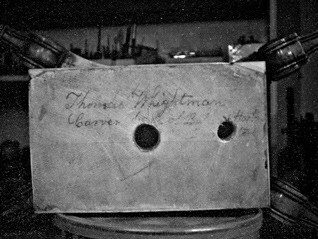 He wrote, “Thomas Whightman / Carver back of [illegible] Horton’s [? ]” in ink on the top of the pillar base of a card table (figs. 34, 35). The inscription can be seen only when the table frame is removed from the base, a task easily accomplished by unfastening the long iron bolt that joins the two parts. As with the Gould desk-and-bookcase, this card table was probably disassembled during storage and shipping. 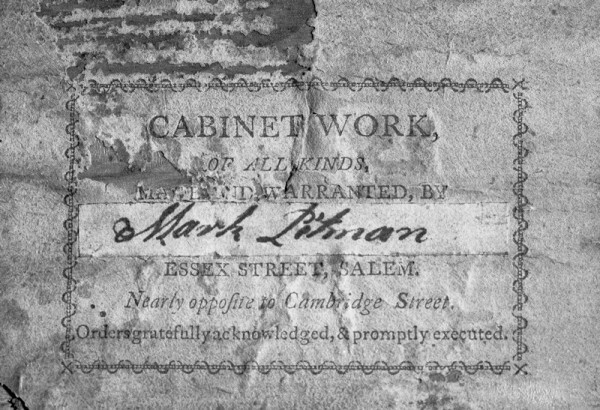 In contrast to Wightman’s hidden inscription, Boston cabinetmaker William Fisk’s (1770–1844) oval mark was stenciled onto the inside bottom of the well of the same card table, where it is clearly visible whenever the top is swiveled open (fig. 36). Historical circumstances suggest that Wightman was shifting much of his work and affiliations from Thomas Seymour to Fisk at about the time this card table was made. It was important to Wightman during this time of transition that fellow workers know where he could be contacted. Certain kinds of initials, sometimes accompanied by a full last name, readily identified the maker of the object in question to contemporary business associates familiar with the furniture-making community but not necessarily to the general public and potential consumers. Because furniture shipping, ventures, piecework arrangements, and other cooperative furniture-making and merchandizing practices created an ongoing and repetitive need for this kind of identification, most of these kinds of marks were made by striking the wood with an iron mark to impress the lettering (fig. 37). 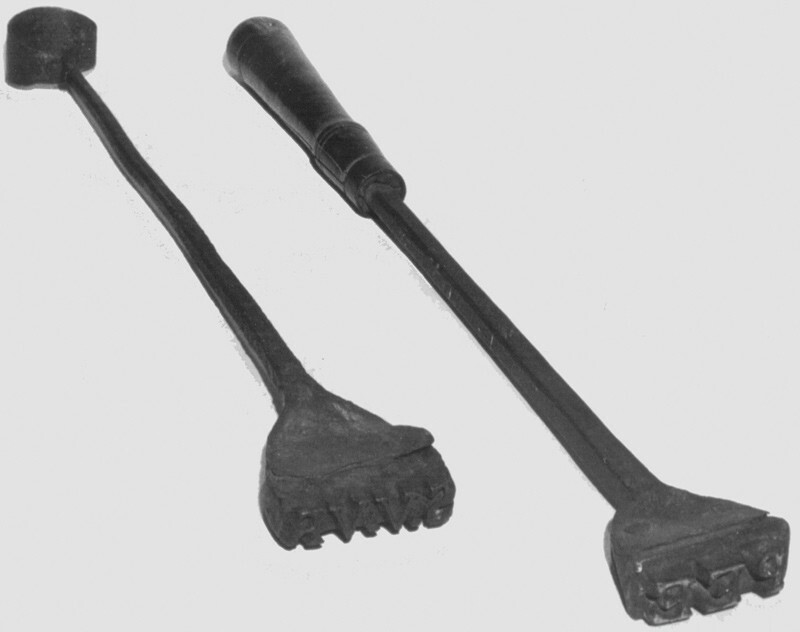 Such marking or branding irons—called a “marking hamor” in a 1676 Philadelphia account book entry—made marking furniture quick and cost-free except for the initial purchase price of the tool. 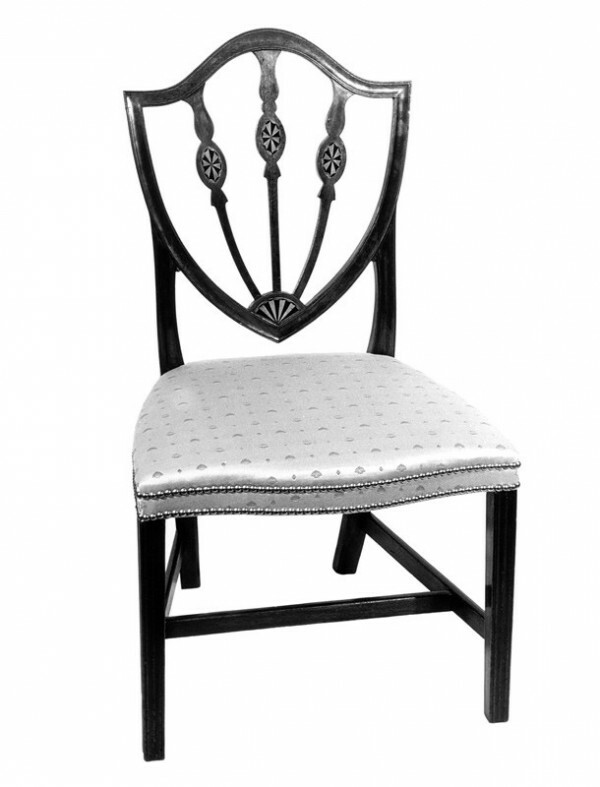 English chair makers probably began using branding or marking irons in the late seventeenth century. Although no specific dates accompany the earliest marked chairs, the numbers of stamps recorded and the variety of carved and caned seating suggests that the practice was well established. Although research is incomplete, English two-initial stamps are widely believed to represent journeymen. Presumably, journeymen in the employ of masters marked the chairs and other furniture forms they made with these small, unobtrusive stamps to document their productivity and receive proper compensation. The closest parallel in America is the Boston-based “I” monogram, which likewise identified specific work executed for a segment of the furniture-making community. Typically, these marks were two serif letters denoting first and last names of a furniture maker. They formed a rectangle and were sometimes separated by a raised pellet or followed by periods (figs. 38, 39). Perhaps because brands or strike marks were small and cost-free to apply, they were occasionally stamped more than once onto the same piece of furniture. The tools used to impress these marks were made of iron or sometimes copper or brass. Copper marks “far exceed Iron ones, for Neatness and Continuance of Heat; . . . they neither burn nor scale away,” as Philadelphia brass founder Daniel King claimed in a 1763 advertisement. On the basis of this and other references, furniture historian Nancy Goyne Evans theorizes that marking irons were probably heated before use but not enough to char the wood. In any event, charred marks are very rare. Some furniture historians distinguish brands denoting burnt marks from struck marks made with cold dies, but given the apparent flexibility in period terminology and the subtle or invisible differences between marks made with heated versus cold marking irons, this distinction seems artificial. 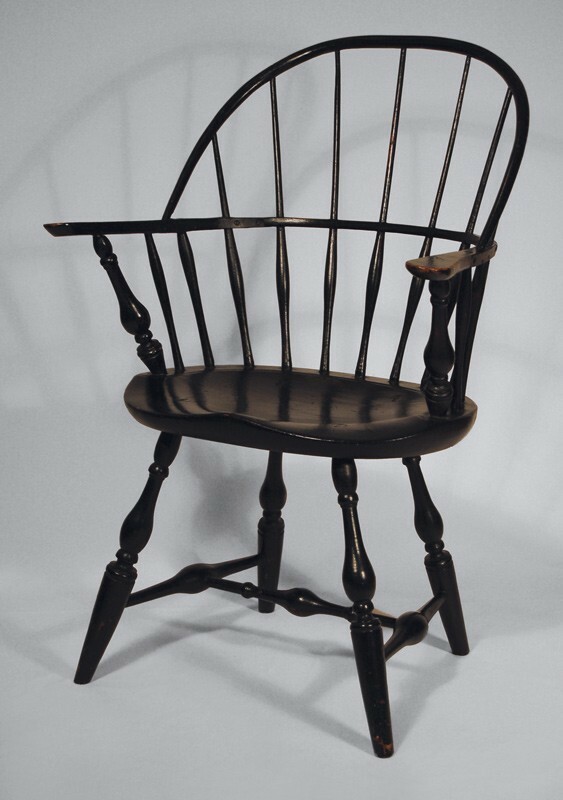 American Windsor chair makers began stamping their work with first initials and full last names by the 1760s. Windsor chair makers produced seating in bulk and probably found marks useful for tracking ownership and maintaining accountability. Port records document thousands of Windsor chairs in the export trade, giving credence to New York maker Thomas Hays’s claim that “Masters of Vessels or Merchants, can be supplied with from 1 to 1000 chairs in one hour.” As was the case with journeymen marks, Windsor makers’ stamps were intended as identifiers for the furniture-making community rather than for the populace at large. Relatively few of the hundreds of recorded marks cite the cities where the maker worked. Even those bearing place names were often vague. The stamp “W[alter] · MACBRIDE / N–YORK” would have been sufficient for a distant customer to locate the maker, but that was not the case with the stamp “E[zekian] · HEWES / SALEM” (fig. 40). 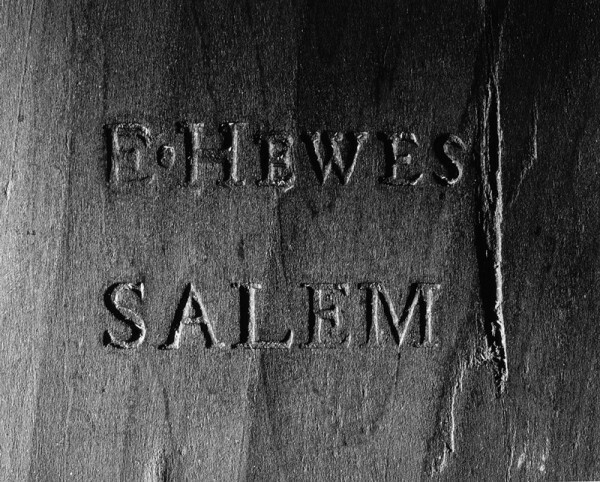 In the case of Hewes, a potential customer might incorrectly assume that he worked in Salem, Massachusetts, rather than his hometown of Salem, New Jersey. The mark “S · ROBERTS / Newmill (New Mills is now Pemberton, New Jersey) presented an even greater challenge because of the small size and relative obscurity of that community. True advertisements, such as those in numerous newspapers, provided adequate directions for contacting the maker, even if it meant contacting a factor at another, more prominent place of business. For most Windsor chair makers, business was either local or based on volume. Local makers could rely on word of mouth in most communities, perhaps augmented by occasional newspaper notices. Those who sought distant markets used merchants or middlemen, whose own selling efforts eliminated the need for furniture labels as advertisements. 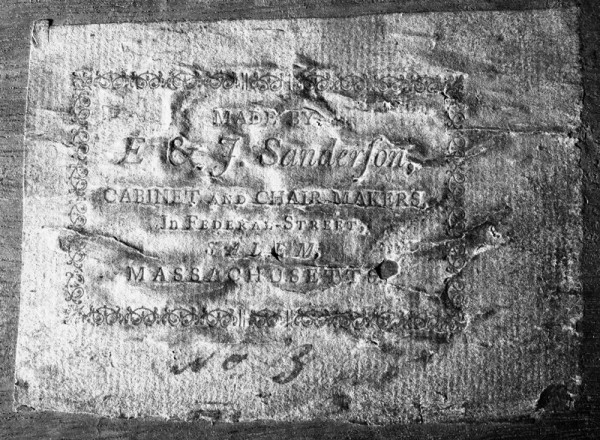 Only a few Windsor makers marked their chairs with the more expensive paper labels, and some of them, such as Joseph Birdsey Jr. of Huntington, Connecticut, and William Chappel of Danbury, Connecticut, called themselves cabinetmakers (figs. 41, 42). Although the use of struck marks increased with expansion of the furniture export trade, the identities of some makers remain difficult to establish. Philadelphia furniture maker Edward James removed uncertainty about the multiple “E·J” marks in a clock case he made by pasting in his descriptive printed label (fig. 43). Similarly, Peregrine Janvier (1781–1865) signed and branded a chest of drawers in 1801. Identifying an “IE” mark on a clock case with movement by Jonas Alrichs of Wilmington, Delaware, as that of John Erwin or his son James is more problematic. It requires searching for all name possibilities in historical records in the presumed area of manufacture. Candidates remain viable unless and until new possibilities are discovered. Identifying “S.F” marks as those of Samuel Fisk (1769–1797) reminds one of the caution that must be exercised when only circumstantial evidence is available to corroborate identity. 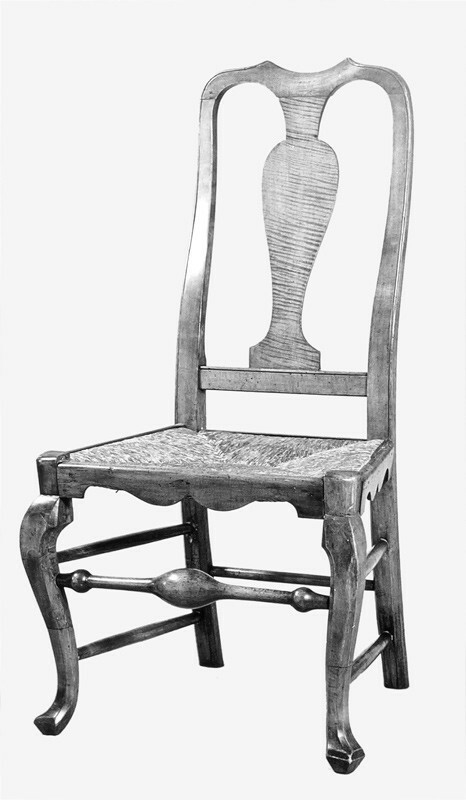 The marks in question accompany an “S·BADLAM” stamp on a side chair and a lolling chair, each of a type made in eastern Massachusetts circa 1800. The name is that of Stephen Badlam (1751–1815), a cabinetmaker who is best known for making an extraordinary chest-on-chest for Elias Haskett Derby in 1791. Badlam worked in Dorchester Lower Mills, south of Boston and Roxbury at the southern end of Washington Street. He also had a son of the same name, but custom dictated that the younger Badlam distinguish himself by adding “junior,” which he did in his printed label. Samuel Fisk was the most prominent artisan with the requisite initials working in the Boston area at that time, but he was not the only one. Simon Francis signed a bowfront chest of drawers, which bears the second inscription “I+Rouse / Boston” that establishes a place of origin for the piece of furniture. Francis was listed in directories from 1797 until 1803, but he worked on Middle Street, a different neighborhood. Although no formal working arrangements between Fisk and Badlam are documented, additional evidence makes the case for Samuel more compelling. Fisk worked along Washington Street at the Roxbury-Boston line. For at least a few years before his early death in 1797, Samuel was in partnership with his brother William. A side chair and a card table each bear the “S.F” struck mark along with a “WF” mark. Another side chair has an “S & WF” die stamp, which more directly reflects a partnership (figs. 44, 45). Other furniture survives with just the “WF” mark, and one is reputedly stamped “CHURCHILL + WF.” In 1799 Lemuel Churchill was listed in Boston tax records as “Journeyman to Mr. [William] Fisk and a Boarder.” He was but one of several journeymen linked with William and Samuel Fisk. The lively network of relationships documented by struck marks should not obscure the fact that the Boston area is especially notable for the number of makers’ struck marks that survive, also evident in late-eighteenth- and early-nineteenth-century furniture of the Hudson River Valley and the North Shore of Massachusetts. Salem furniture makers in particular were not only active markers of their products, a practice that paralleled a thriving export trade, but also some of them left voluminous and revealing records. An 1802 shipping invoice for cabinetmaker Jacob Sanderson (1757–1810) lists crates identified by number and “I+S,” implying that each crate was so marked. 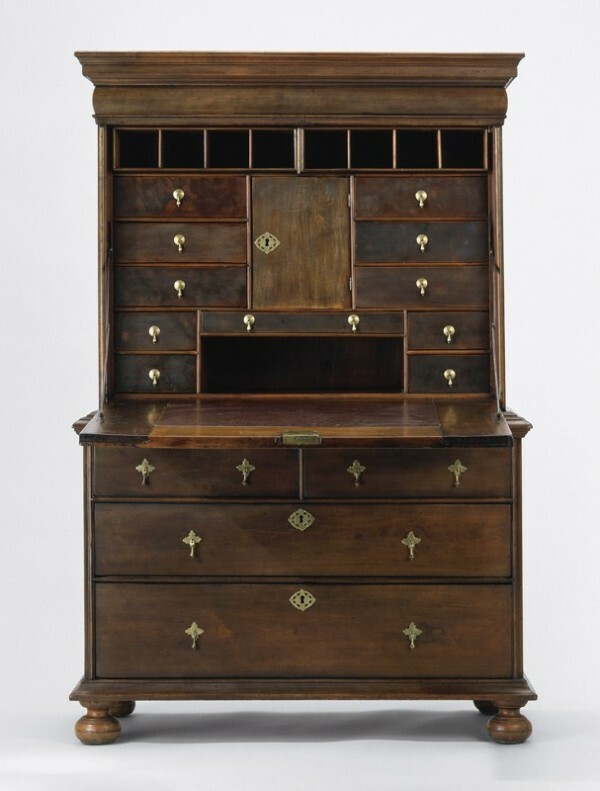 In 1803 Jacob’s brother Elijah (1752–1825) wrote his export agent, “you will find that my furniture is all marked with a brand E S on the back of each piece besides the mark of the case.” Yet another Salem cabinetmaker, Samuel Barnard (1776–1858), also documented this practice when he noted on an 1805 invoice for furniture bound for the West Indies that his property was to be marked “SB.” Jacob’s marks were probably painted, whereas Elijah’s were clearly branded on the piece of furniture in addition to the crate. Two “ES” die-struck pieces of furniture, a night cabinet (or commode) and a side chair, have long been identified as the work of Elijah Sanderson, who made the tambour desk illustrated in figures 46 and 47. Elijah worked in partnership with Jacob until the latter’s death. Furniture survives bearing the printed label “E. & J. Sanderson, CABINET AND CHAIR-MAKERS In FEDERAL-STREET, SALEM, MASSACHUSETTS” (fig. 48). But partnerships did not necessarily preclude individual ventures, and makers employed multiple types of marks. Both Elijah and Jacob exported furniture on their own accounts. In 1804, for example, Jacob consigned twenty-two cases of furniture to Savannah, and two years later he shipped another thirty-eight cases of mahogany furniture, including “secretaries, sideboards, &c.” to Madeira, the Canary Islands, and Surinam. Surviving manuscripts document numerous other Sanderson ventures to ports all over the world. In addition to Elijah’s printed label and probable “ES” die stamp, a Salem-area card table bears the painted mark “E·S” on the fixed rear rail (fig. 49). Jacob also used multiple marks. In addition to the printed label, he signed his name to a mahogany desk-and-bookcase. A pair of federal card tables, each painted “I + S” on the underside of the top, may also be by him. Another mahogany desk-and-bookcase bears a “JS” brand on the outside center of the outer lower-case backboards (figs. 50, 51). Unlike the “ES” mark, which depicts relatively rare initials, the “JS” mark (and painted “I + S” mark) refers to more common initials and consequently introduces uncertainty about the maker’s identity. If a Salem origin for the card tables and desk is correct, then Jacob is the leading and virtually only candidate. Joseph Short (1771–1819) worked in Newburyport, although his several documented pieces of furniture are less ambitious. Several Boston makers have JS as initials. They include John Smith of the short-lived partnership of Smith & Hitchings (ca. 1803–1804), John Simpkins and Joseph Simpson, each of whom is listed as a cabinetmaker in a 1789 directory, and John Seymour. Not surprisingly, several early-nineteenth-century pieces of furniture from eastern Massachusetts bear unidentified painted or struck “JS” or “IS” marks (by ca. 1790, Js had largely—but not entirely—displaced J-sounding Is). Assigning identities to these possibilities requires independent evidence that either confirms or contradicts manufacture by a specific maker. Regarding the “JS” marks, for example, the card tables and desk-and-bookcase each have pluses and minuses. Nothing of the urbane design or construction of the “I + S” pair of card tables distinguishes them as an exclusive Salem product. They may be from somewhere in the complex Boston furniture-making community. Similarly, an indistinct chalk signature on the underside of one tabletop begins with a “J,” but the name is not Jacob. It may be that of a first owner, as could the “I + S” initials. Yet the card tables are marked in the same manner as specified on the 1802 Jacob Sanderson invoice. Likewise, the desk-and-bookcase is probably, but not definitely, of Salem origin. Also, the “JS” die has not been recorded on other furniture. In support of the Sanderson attribution, the location of the mark is appropriate for exported furniture. 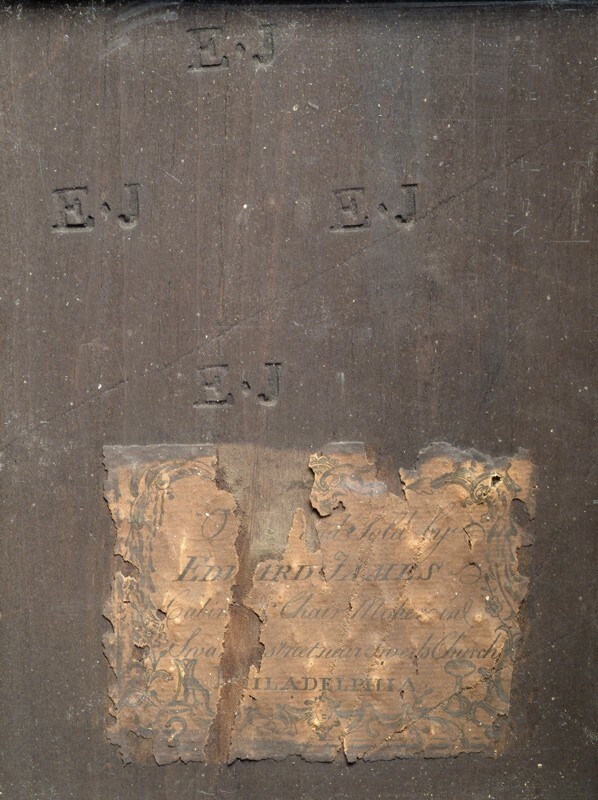 Although no shipping cases have yet come to light, Elijah’s 1803 letter noted that his “ES” mark was to be struck on each piece of furniture “besides the mark of the case,” suggesting that the mark was visible from outside the crate along with a crate number or other identifier. 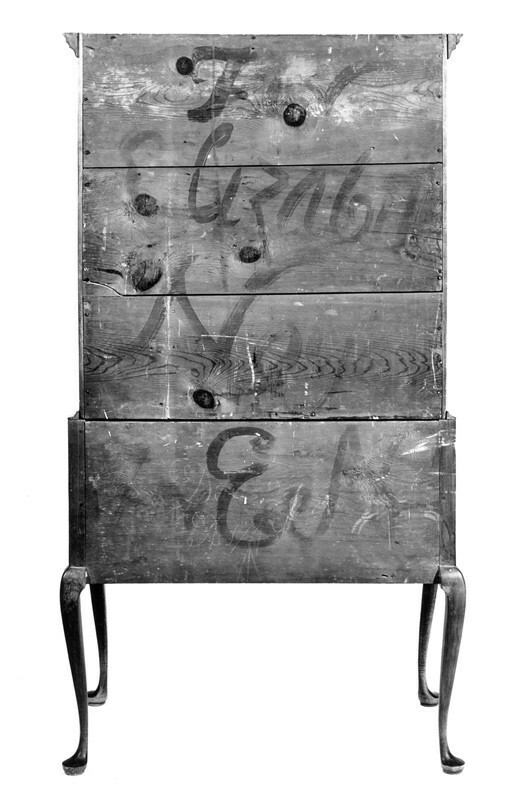 Similarly, chalk inscriptions on furniture carcasses indicating “back,” “top,” or “bottom” were intended to be read after the object had been crated and was being handled by shippers. Stephen Badlam was very specific regarding his shipping instructions for the monumental and ornately carved Derby chest-on-chest. Handwritten labels pasted to the tops of both the upper and lower cases state: “Keep this side up & preserve it from the Sun from wet & from bruises. It is of Consequence enough to merit great attention.” Depending on specific needs, shipping crates probably did not always fully enclose the furniture but were constructed primarily to protect corners, fronts, and sides. In contrast, the pine boards that formed furniture backs, bottoms, and some tops were not very susceptible to damage and were convenient message boards. 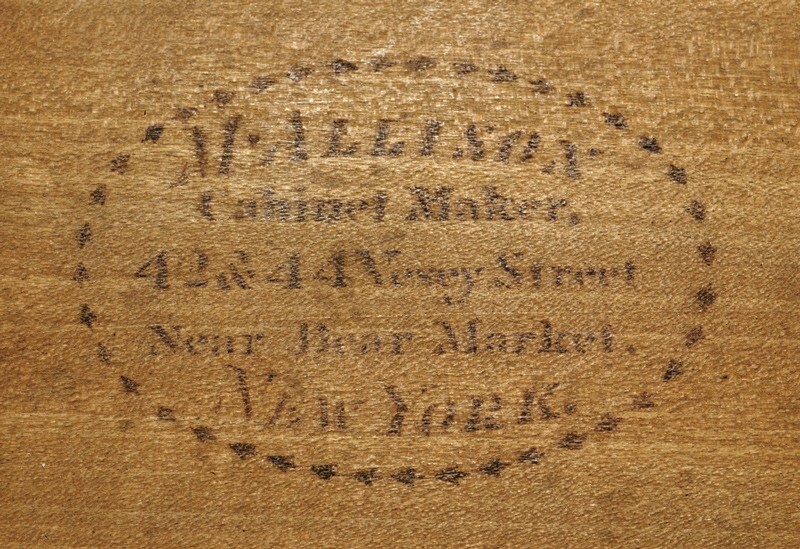 By the 1810s some furniture makers began using stencils to create maker’s marks. New York furniture maker Michael Allison was among the first. In addition, over the course of his long career, he used more than a dozen different paper labels, some of which include printed dates. One of his stencils located Allison at 42 and 44 Vesey Street, an address that he occupied between 1808 and 1815. As with all stencil marks, its appearance was modeled on printed labels, although the stenciling process produced a much coarser image. Allison’s name, street address, and reference to being near “Bear Market,” which must have been a familiar landmark, fit within an oval border. One of his printed labels displaying the identical address (a second version with that address also survives) has an oval surround and may have been a direct design source (figs. 52, 53). Several other Allison labels record number 42 only and may be earlier. 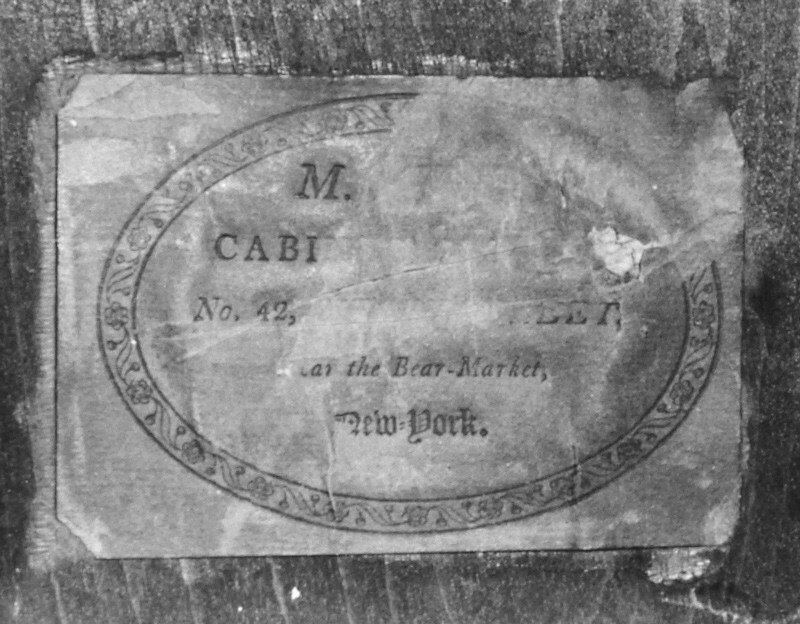 His later labels, including one dated 1817 that pictures his “Cabinet and Upholstery Furniture Warehouse” at numbers 46 and 48 Vesey Street, are wordier and graphically more complex (fig. 54). Several Boston-area furniture makers used stencils, as did some makers in Philadelphia and various other locales. Although stencils were used on many types of decorative arts, they never replaced paper labels on furniture. Mid-eighteenth-century British trade cards set graphic standards that far exceeded the constraints of stencils. These distinctive forms of advertising were larger than labels and communicated more complex messages through ornate illustrations. Although not necessarily applied to pieces of furniture, they influenced label design. A rare American trade card, made for Benjamin Randolph circa 1770, used the same wording as conventional labels (fig. 55). The power of all these graphics—regardless of size—lay in their use of imagery and design to confer on the named furniture maker such values as exceptional skills, position within the trade, and good taste. The Barry and Camp labels (figs. 18-20) used furniture designs that were more than fifteen years old, indicating that the suggestive qualities of the images were more important than specific style information. Similarly, an illustration of a large furniture warehouse, such as Michael Allison’s, implied investment, permanence, and success, all of which suggested that a furniture order from that source would probably be more than satisfactory. Early American furniture has acquired new layers of meaning since it was first made and used. The presence of makers’ labels and marks on a few pieces of that furniture has contributed value and interest—both historical and monetary—because of the information they contain. In either case, greater attention to the particulars of these markings results in more nuanced and accurate interpretations. For assistance with this article the author thanks Jay Robert Stiefel and Anne A. Verplanck. Margaretta M. Lovell, “‘Such Furniture as Will Be Most Profitable’: The Business of Cabinetmaking in Eighteenth-Century Newport,” Winterthur Portfolio 26, no. 1 (Spring 1991): 44–48. Morrison H. Heckscher, John Townsend, Newport Cabinetmaker (New York: Metropolitan Museum of Art, 2005), pp. 56, 61. For further comment, see Jay Robert Stiefel, review of John Townsend, Newport Cabinetmaker in Journal of the Early Republic (Winter 2006): 672–74. The Nicholas Disbrowe inscription cited as seventeenth-century in early-twentieth-century publications is not authentic. See Penrose R. Hoopes, “Notes on Some Colonial Cabinetmakers of Hartford,” Antiques 23, no. 5 (May 1933): 171; Patricia E. Kane, “The Seventeenth-Century Furniture of the Connecticut Valley: The Hadley Chest Reappraised,” in Arts of the Anglo-American Community in the Seventeenth Century, edited by Ian M. G. Quimby (Charlottesville, Va.: University Press of Virginia for the Winterthur Museum, 1975), p. 79. David B. Warren, Michael K. Brown, Elizabeth Ann Coleman, and Emily Ballew Neff, American Decorative Arts and Paintings in the Bayou Bend Collection (Houston, Tex. : Museum of Fine Arts in association with Princeton University Press, 1998), no. F31. Christopher Gilbert states, “no [English] furniture marked by a maker is known that can be dated before 1700, although some may date slightly before,” in Pictorial Dictionary of Marked London Furniture, 1700–1840 (Leeds, Eng. : Furniture History Society and W. S. Maney and Son, 1996), p. 2. According to Gilbert, John Gumley carved his name and the date May 1703 into a large mirror at Chatsworth (Pictorial Dictionary, p. 4). Philadelphia: Three Centuries of American Art (Philadelphia: Philadelphia Museum of Art, 1976), pp. 13–14; Cathryn J. McElroy, “Furniture in Philadelphia: The First Fifty Years,” in American Furniture and Its Makers, edited by Ian M. G. Quimby, special issue, Winterthur Portfolio 13 (1979): 76–77; Jack L. Lindsey, Worldly Goods: The Arts of Early Pennsylvania, 1680–1758 (Philadelphia: Philadelphia Museum of Art, 1999), pp. 133–34. According to Lindsey’s problematic biographical sketch, Evans, born in 1679, completed his apprenticeship in 1704 at age twenty-five yet sold William Penn a chest of drawers in 1701 and worked as a ship’s joiner from 1703 to 1709. These biographical references may describe more than one individual of that name. A second chest of drawers with Beake’s inscribed name has no accompanying date (Decorative Arts Photographic Collection, file no. 78.877, Winterthur Museum, Winterthur, Delaware) [hereafter cited as DAPC]. Quoted in McElroy, “Furniture in Philadelphia,” pp. 73, 79. 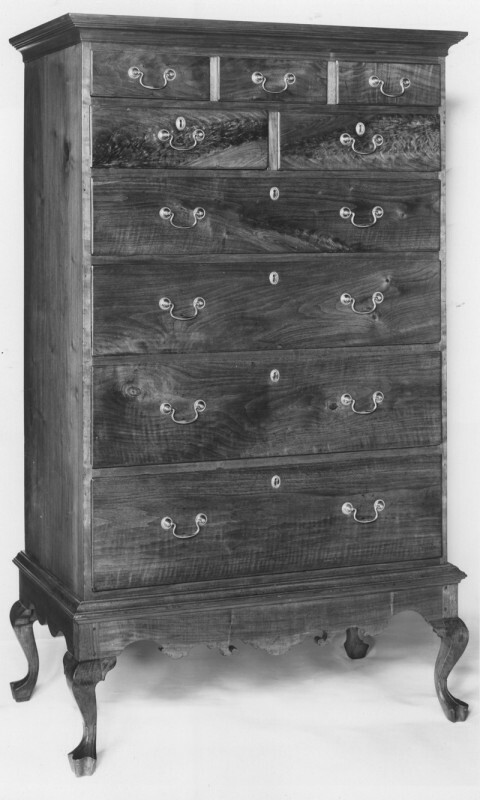 Benno M. Forman challenges the Beakes-Till relationship but does not cite McElroy’s article in “The Chest of Drawers in America, 1635–1730: The Origins of the Joined Chest of Drawers,” Winterthur Portfolio 20, no. 1 (Spring 1985): 28. Margaret Berwind Schiffer, Furniture and Its Makers of Chester County, Pennsylvania (1966; reprint, Exton, Pa.: Schiffer Publishing, 1978), pp. 22–23, figs. 2, 3. William C. Ketchum Jr., with the Museum of American Folk Art, American Cabinetmakers: Marked American Furniture, 1640–1940 (New York: Crown Publishers, 1995), pp. 107–8. Benno M. Forman, American Seating Furniture, 1630–1730: An Interpretive Catalogue (New York: W. W. Norton, 1988), pp. 260–66. 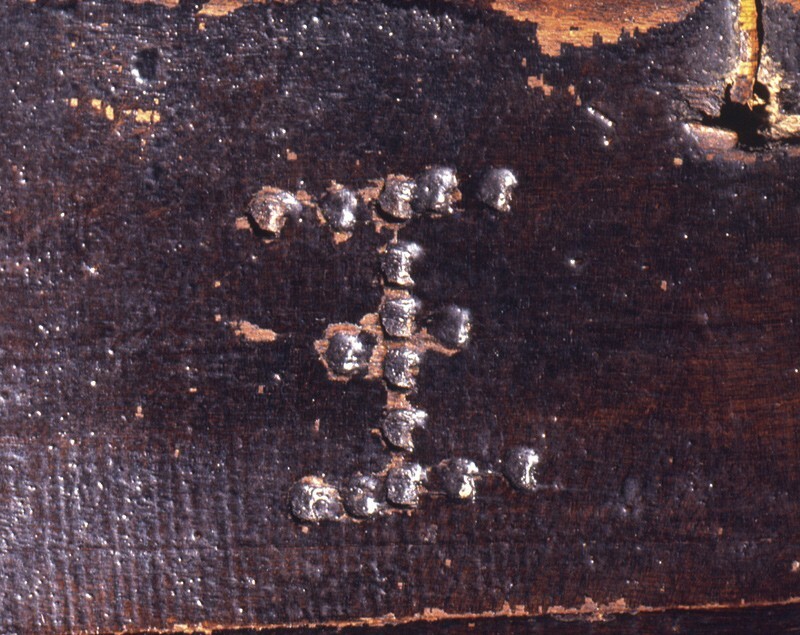 Forman notes another mark struck into the back of the crest rail of a Philadelphia leather-upholstered side chair of 1695 to 1710. This unidentified symbol is “too deliberate to be an accident, although its meaning is at the moment obscure” (p. 296). Adam Bowett, English Furniture from Charles II to Queen Anne, 1660–1714 (Woodbridge, Suffolk, Eng. : Antique Collectors’ Club, 2002), pp. 204–5. See also Gilbert, Pictorial Dictionary, pp. 3–4. R. W. Symonds, “Old English Furniture and Its Makers: The Problem of Identification,” in Ambrose Beal, The London Furniture Makers from the Restoration to the Victorian Era, 1660–1840 (London: B. T. Batsford, 1953), p. 216. The labels are reproduced as pls. 88–93 in William Macpherson Hornor Jr., Blue Book, Philadelphia Furniture: William Penn to George Washington (Philadelphia: privately printed, 1935). Savery’s life and work are summarized in Philip D. Zimmerman, “William Savery,” in American National Biography (New York: Oxford University Press, 1999), 19: 320–21. The walnut chest and label are illustrated in “Another Savery Label,” Antiques 9, no. 2 (February 1926): 77. The 1771 reference is in Thomas Affleck’s January 2 bill to John Cadwalader that lists “2 Commode Card Tables” and “2 Mahogany Commode Sophias for the Recesses” among many other items. 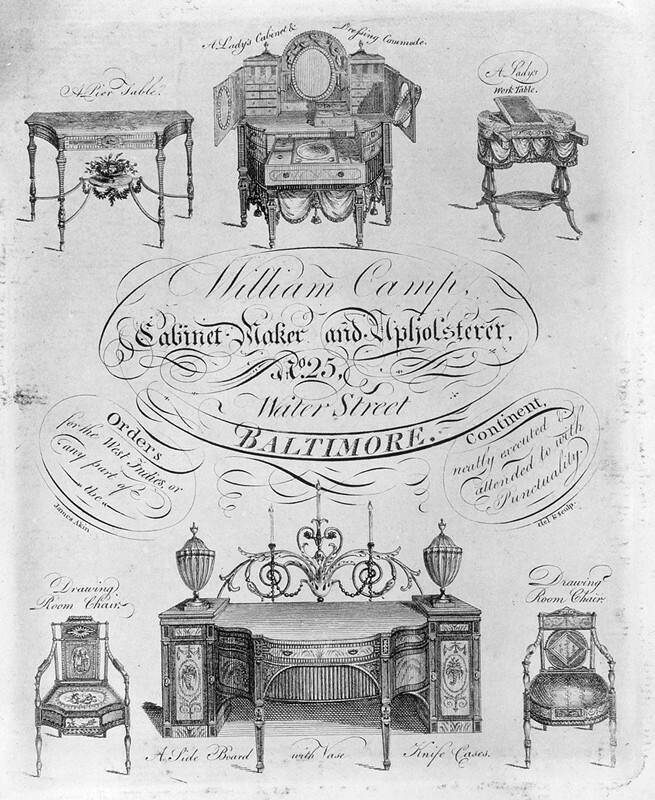 For discussion of the terminology, see Philip D. Zimmerman, “A Methodological Study in the Identification of Some Important Philadelphia Chippendale Furniture,” in Quimby, ed., American Furniture and Its Makers, pp. 193–208; see also pp. 200, 204. Judith Coolidge Hughes, “The Labels of John Elliott Jr.,” Antiques 91, no. 4 (April 1967): 514–17. “Collectors’ Notes: John Elliott Sr.,” Antiques 107, no. 5 (May 1975): 1068. The first American label appears in Alfred Coxe Prime, “John Elliott: Cabinet and Looking-Glass Maker of Philadelphia,” Pennsylvania Museum Bulletin 19, no. 85 (April 1924): 135. 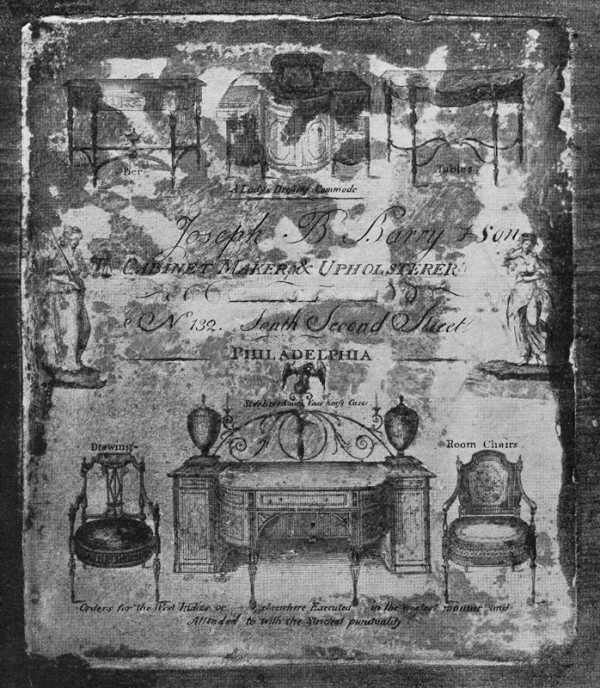 Mary Ellen Hayward, “The Elliotts of Philadelphia: Emphasis on the Looking Glass Trade, 1755–1810” (master’s thesis, University of Delaware, 1971), pp. 25–34. Morrison H. Heckscher, American Furniture in The Metropolitan Museum of Art, Late Colonial Period: The Queen Anne and Chippendale Styles (New York: Metropolitan Museum of Art and Random House, 1985), no. 81. Clement E. Conger and Alexandra W. Rollins, Treasures of State: Fine and Decorative Arts in the Diplomatic Reception Rooms of the U.S. Department of State (New York: Harry N. Abrams, 1991), pp. 94–95, no. 13. For many labeled Frothingham pieces of furniture, see Richard H. Randall Jr., “Benjamin Frothingham,” in Boston Furniture of the Eighteenth Century, edited by Walter Muir Whitehill (Boston: Colonial Society of Massachusetts, 1974), pp. 223–49. Only one label each for Job and Edmund Townsend is known. 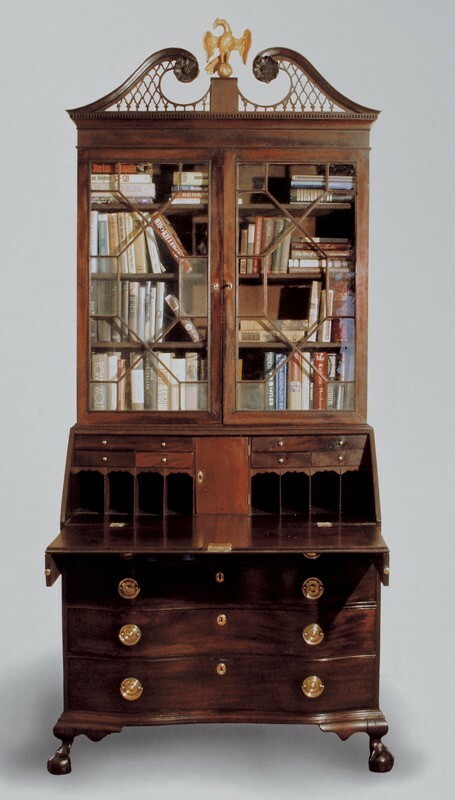 For a flat-top desk-and-bookcase labeled by Job Townsend, see Christopher P. Monkhouse and Thomas S. Michie, American Furniture in Pendleton House (Providence: Museum of Art, Rhode Island School of Design, 1986), pp. 94–96, no. 38. For a bureau table bearing the label of Edmund Townsend, see Edwin J. Hipkiss, Eighteenth-Century American Arts: The M. and M. Karolik Collection (Cambridge, Mass. : Harvard University Press for the Museum of Fine Arts, Boston, 1941), no. 68. 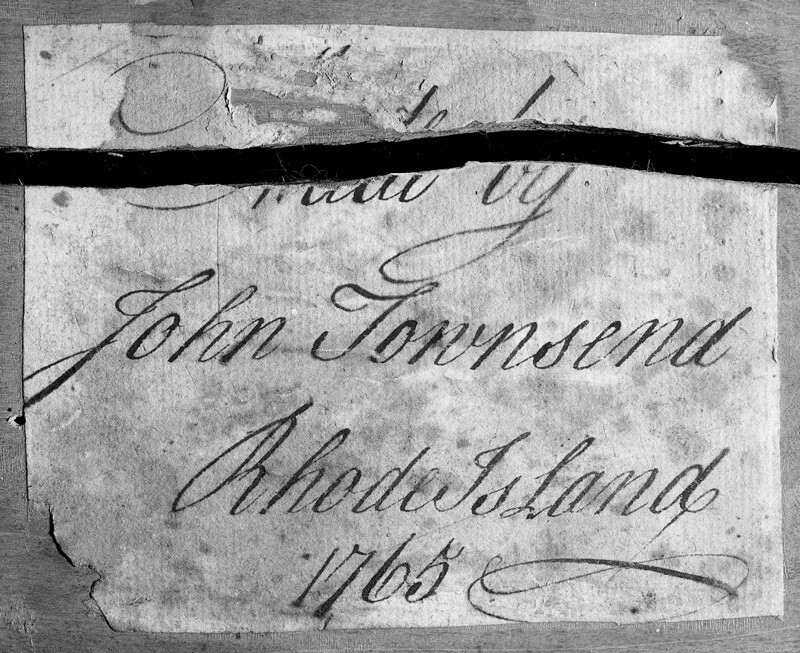 Heckscher, John Townsend, Newport Cabinetmaker, pp. 61–64. Bernard & S. Dean Levy advertisement, Antiques 94, no. 3 (September 1978): 356; Betty Ring, “Check List of Looking-Glass and Frame Makers and Merchants Known by Their Labels,” Antiques 119, no. 5 (May 1981): 1182. Meyric R. Rogers, “George Shipley: His Furniture and His Label, A Set of Side Chairs,” Antiques 79, no. 4 (April 1961): 374; Martha Gandy Fales, “A Classical Sideboard,” Antiques 79, no. 4 (April 1961): 375. Benjamin A. Hewitt, Patricia E. Kane, and Gerald W. R. Ward, The Work of Many Hands: Card Tables in Federal America, 1790–1820 (New Haven, Conn.: Yale University Art Gallery, 1982), no. 32. Illustrated in Ketchum, American Cabinetmakers, p. 123. Illustrated in Joseph Downs and Ruth Ralston, A Loan Exhibition of New York State Furniture (New York: Metropolitan Museum of Art, 1934), n.p. Illustrated in Hornor, Blue Book, pl. 432; Robert Bishop, Centuries and Styles of the American Chair, 1640–1970 (New York: E. P. Dutton & Co., 1972), fig. 314. Maureen O’Brien Quimby, “The Political Art of James Akin,” Winterthur Portfolio 7 (1972): 59–112. Illustrated in Robert T. Trump, “Joseph B. Barry, Philadelphia Cabinetmaker,” Antiques 107, no. 1 (January 1975): 161, fig. 5. Philip D. Zimmerman et al., Sewell C. Biggs Museum of American Art: A Catalogue, 2 vols. (Dover, Del. : Biggs Museum, 2002), 1: no. 81. The motivation behind leaving a signature seems similar to that of western explorer William Clark, who scratched his name and date in the rock face of Pompeys Piller, Montana, in 1806. Cited in Kathleen Matilda Catalano, “Cabinetmaking in Philadelphia, 1820–1840” (master’s thesis, University of Delaware, 1972), p. 111. Nancy E. Richards and Nancy Goyne Evans, New England Furniture at Winterthur (Winterthur, Del. : Winterthur Museum, 1997), no. 182. A signature on a sideboard eluded separate examinations by a dealer and an independent consultant as well as former owners and interested parties. Viewing the signature requires peering around the lower center cupboard doors to see the back surface of the fixed front panels. Philip D. Zimmerman, “A Rare Eight-Legged Federal Sideboard, Connecticut, 1795–1805” (unpublished report for Bernard & S. Dean Levy, 1997); Thomas Kugelman, Alice Kugelman, and Robert Lionetti, Connecticut Valley Furniture: Eliphalet Chapin and His Contemporaries, 1750–1800 (Hartford: Connecticut Historical Society, 2005), pp. 368–70, no. 169. Another sideboard bears its maker’s signature on a framing member underneath the top and is visible only when the top is removed. Zimmerman, Sewell C. Biggs Museum, 1: no. 49. Furniture historians Thomas and Alice Kugelman and Robert Lionetti cite several examples of this practice in their study of Hartford-area case furniture; Kugelman, Kugelman, and Lionetti, Connecticut Valley Furniture, pp. 114, 148–50, 162–64, 196, 366. 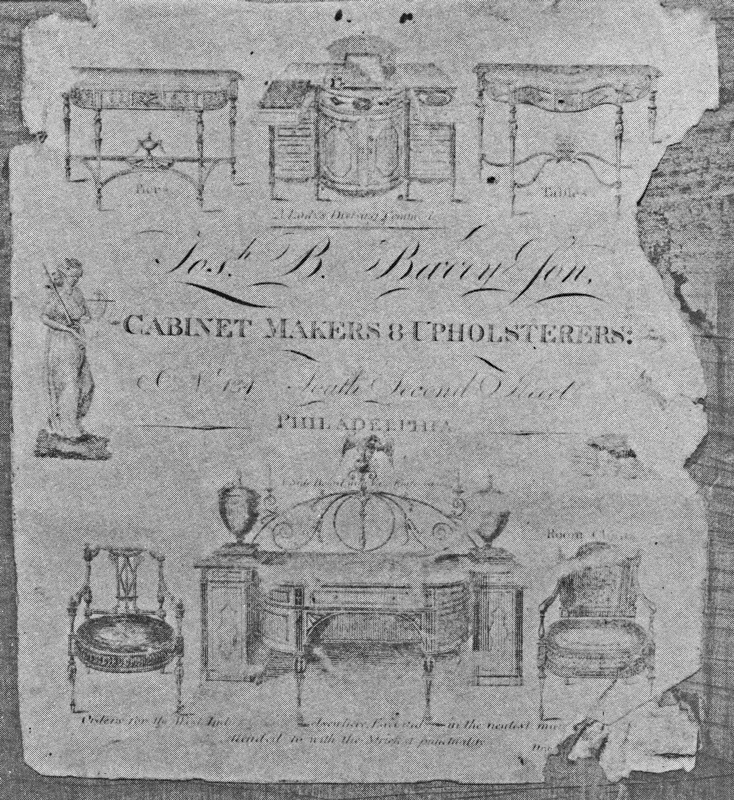 Deborah Ducoff-Barone, “Philadelphia Furniture Makers, 1800–1815,” Antiques 145, no. 5 (May 1991): 994. Schiffer, Furniture and Its Makers of Chester County, pp. 100, 101, 316. The 1800 and 1810 United States Census also records Gregg in Kennett Square. Chester County inventories #8938, as cited in Schiffer, Furniture and Its Makers of Chester County, pp. 100–101. Ducoff-Barone, “Philadelphia Furniture Makers, 1800–1815,” 983, pl. 3. Donna-Belle Garvin, “Two High Chests of the Dunlap School,” Historical New Hampshire 35, no. 2 (Summer 1980): 165V. ; Richards and Evans, New England Furniture at Winterthur, no. 175. Garvin, “Two High Chests of the Dunlap School,” pp. 180–83. Israel Sack advertisement, Antiques 115, no. 5 (May 1979): inside front cover. Peter Benes, Old-Town and the Waterside: Two Hundred Years of Tradition and Change in Newbury, Newburyport, and West Newbury, 1635–1835 (Newburyport, Mass. : Historical Society of Old Newbury, 1986), pp. 50–51, no. 23. Elizabeth Noyes (1731–1816) married James Smith III (1725–1787) of Newbury. She received furniture from her parents. Deborah D. Waters, Delaware Collections in the Museum of the Historical Society of Delaware (Wilmington, Del. : Historical Society of Delaware, 1984), pp. 30–31, no. 12. Collections of the Biggs Museum of American Art, Dover, Delaware. Inconsistent nail-hole patterns indicate that the backboards are not original to the looking-glass frame. This looking glass seems to be the same one described with a different inscription in Charles G. Dorman, Delaware Cabinetmakers and Allied Artisans, 1655–1855 (Wilmington, Del. : Historical Society of Delaware, 1960), p. 88. Margaret Burke Clunie, “Salem Federal Furniture” (master’s thesis, University of Delaware, 1976), pp. 158, 210. Israel Sack advertisement, Antiques 56, no. 6 (December 1949): 399; M. Ada Young, “Five Secretaries and the Cogswells,” Antiques 88, no. 4 (October 1965): 479–81. Morrison H. Heckscher interprets the inscription as “I [?] Back” in American Furniture in The Metropolitan Museum of Art, no. 179. Gerald W. R. Ward, American Case Furniture in the Mabel Brady Garvan and Other Collections at Yale University (New Haven, Conn.: Yale University Art Gallery, 1988), nos. 62, 67, 160, 168, 177. Fitch to Pease, May 8, 1705, Fitch Letterbook, American Antiquarian Society, as quoted in Forman, American Seating Furniture, p. 264. Benes, Old-Town and the Waterside, p. 51. Ward, American Case Furniture, pp. 169–70, no. 80. Brock Jobe, Portsmouth Furniture: Masterworks from the New Hampshire Seacoast (Boston: Society for the Preservation of New England Antiquities, 1993), pp. 109–10, no. 9. 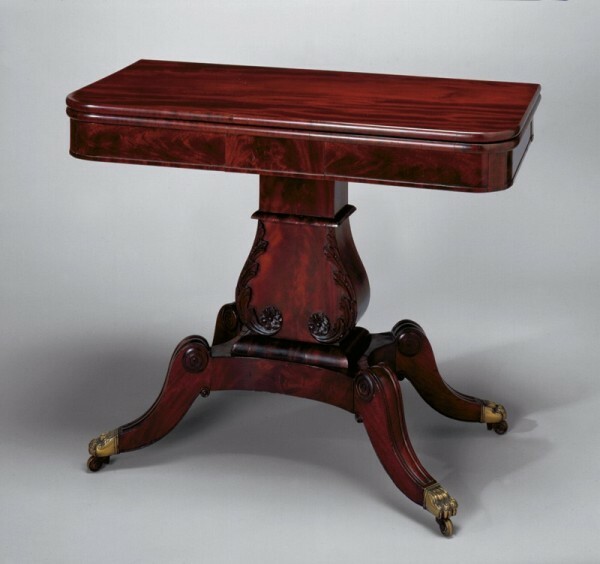 Heckscher, American Furniture in The Metropolitan Museum of Art, no. 181. Philip D. Zimmerman with David Jorgensen, “A Grecian Card Table by William Fisk and Thomas Wightman of Boston,” Antiques 169, no. 5 (May 2006): 146–51. Account Book of maritime joiner Gregory Marlow, as quoted in Philadelphia: Three Centuries of American Art, p. 15. Victor Chinnery argues that initial and name brands on seventeenth-century-style furniture and earlier are ownership rather than makers’ marks (Victor Chinnery, Oak Furniture: The British Tradition [Woodbridge, Suffolk, Eng. : Antique Collectors’ Club, 1979], pp. 57–59). 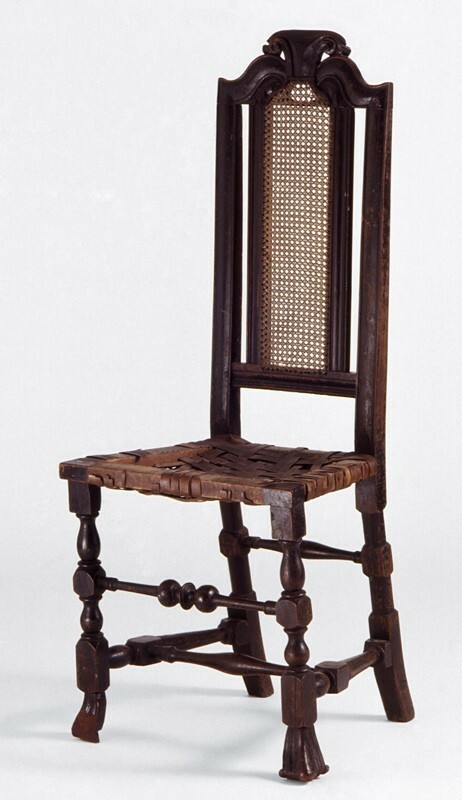 Bernard D. Cotton treats struck makers’ marks as routine in his study of late-eighteenth- and nineteenth-century chair making, The English Regional Chair (Woodbridge, Suffolk, Eng. : Antique Collectors’ Club, 1990). Bowett, English Furniture from Charles II to Queen Anne, pp. 89–90. Gilbert, Pictorial Dictionary, p. 3. Philadelphia Gazette, September 22, 1763, as quoted in Nancy Goyne Evans, Windsor-Chair Making in America: From Craft Shop to Consumer (Hanover, N.H.: University Press of New England, 2006), p. 80; see also p. 81. For a detailed study of similarly marked owners’ names, see Myrna Kaye, “Marked Portsmouth Furniture,” Antiques 113, no. 5 (May 1978): 1098–104. Nancy Goyne Evans, “American Painted Seating Furniture: Marketing the Product, 1750–1840,” in Perspectives on American Furniture, edited by Gerald W. R. Ward (New York: W. W. Norton & Co, 1988), pp. 160–64. Thomas Hays advertisement, Daily Advertiser (New York), April 8, 1801, quoted in Rita Susswein Gottesman, The Arts and Crafts in New York, 1800–1804: Advertisements and News Items from New York City Newspapers (New York: New-York Historical Society, 1965), p. 144. Nancy Goyne Evans, American Windsor Chairs (New York: Hudson Hills Press in association with the Winterthur Museum, 1996), pp. 180–83, 205; see also pp. 337–38. Philadelphia: Three Centuries of American Art, pp. 93–94. Deborah D. Waters, Plain and Ornamental: Delaware Furniture, 1740–1890 (Wilmington: Historical Society of Delaware, 1984), p. 26, no. 14. Philip D. Zimmerman, Delaware Clocks (Dover, Del. : Biggs Museum, 2006), pp. 48–49. Charles F. Montgomery, American Furniture: The Federal Period (New York: Viking Press, 1966), nos. 30, 110, p. 479. 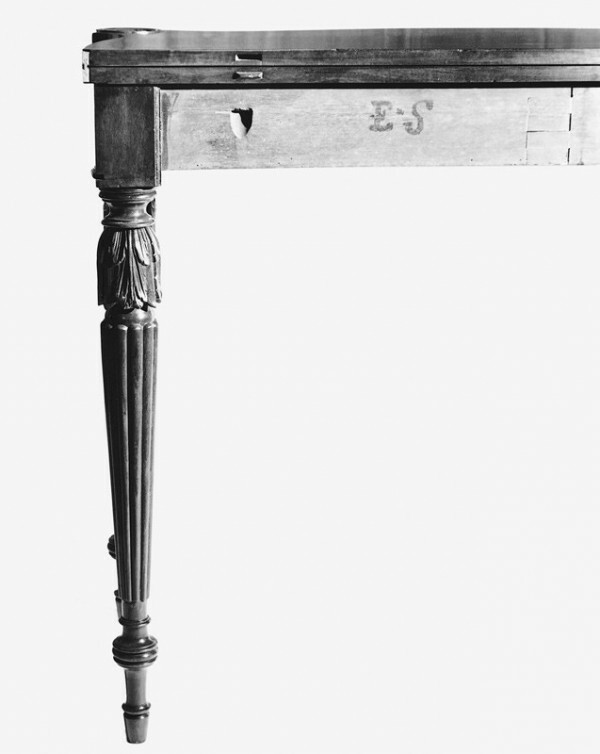 Montgomery speculated that the “SF” mark was possibly that of an owner but more likely that “of a journeyman who made the chairs for Badlam.” Ward, American Case Furniture, pp. 171–77, no. 82. Montgomery, American Furniture: The Federal Period, no. 253. DAPC, 75.292. Ethel Hall Bjerkoe, The Cabinetmakers of America (1957; reprint, New York: Bonanza Books, n.d.), p. 95. Chair marks illustrated in Ketchum, American Cabinetmakers, p. 120. Hewitt, Kane, and Ward, The Work of Many Hands, no. 15. The card table is incorrectly identified as made in Salem rather than Boston-Roxbury. DAPC, 97.829–.830. Richard H. Randall Jr., American Furniture in the Museum of Fine Arts, Boston (Boston: Museum of Fine Arts, 1965), no. 158; Paul J. Foley, Willard’s Patent Time Pieces: A History of the Weight-Driven Banjo Clock, 1800–1900 (Norwell, Mass. : Roxbury Village Publishing, 2002), p. 251. The author does not illustrate the mark or describe further the furniture form. Anne Rogers Haley, “Boston Cabinetmakers and Allied Craftsmen, 1780–1799: A New Source,” Antiques 149, no. 5 (May 1996): 763. Quoted in Mabel M. Swan, “Elijah and Jacob Sanderson, Early Salem Cabinetmakers,” Essex Institute Historical Collections 70, no. 4 (October 1934): 331. Hewitt, Kane, and Ward, The Work of Many Hands, no. 19. Dean A. Fales Jr., “Essex County Furniture—Documented Treasures from Local Collections, 1660–1860,” Essex Institute Historical Collections 101, no. 3 (July 1965): nos. 36, 37; Randall, American Furniture in the Museum of Fine Arts, Boston, no. 158. For a tambour desk with the same brand, see Sotheby’s, The Collection of Mr. and Mrs. Lammot du Pont Copeland, New York, January 19, 2002, lot 316. Montgomery, American Furniture: The Federal Period, no. 322. 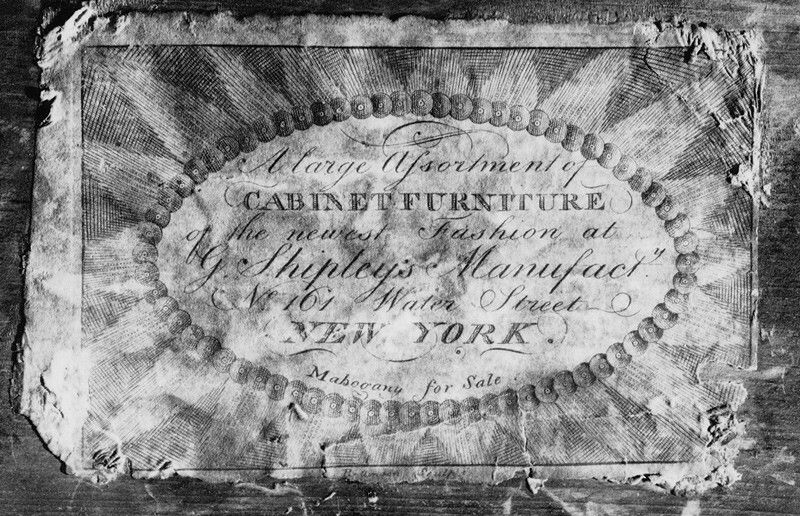 [Henry Wyckoff Belknap], “Furniture Exported by Cabinetmakers of Salem,” from notes left by Henry Wyckoff Belknap, Essex Institute Historical Collections 85, no. 4 (October 1949): 350–55. DAPC, 73.341. Israel Sack advertisement, Antiques 72, no. 6 (December 1957): inside front cover. Wendy Cooper and Kemble Widmer II, “Seeing Double: Winterthur’s Sanderson Card Table Finds Its Mate,” Catalogue of Antiques and Fine Art 4, no. 6 (2004): 274–79. Martha G. Fales, “The Shorts, Newburyport Cabinetmakers,” Essex Institute Historical Collections 102, no. 3 (July 1966): 233–34, figs. 3–5. David L. Barquist, American Tables and Looking Glasses in the Mabel Brady Garvan and Other Collections at Yale University (New Haven, Conn.: Yale University Art Gallery, 1992), no. 94; Bjerkoe, Cabinetmakers of America, p. 201. Ward, American Case Furniture, p. 172, no. 82.